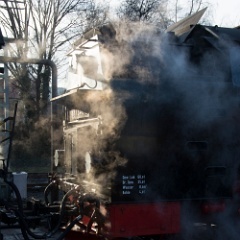 On the HSB in good weather! 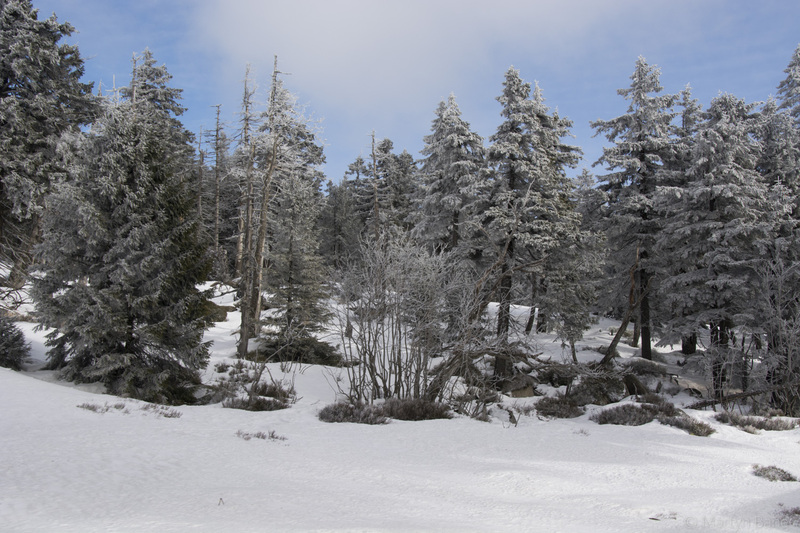 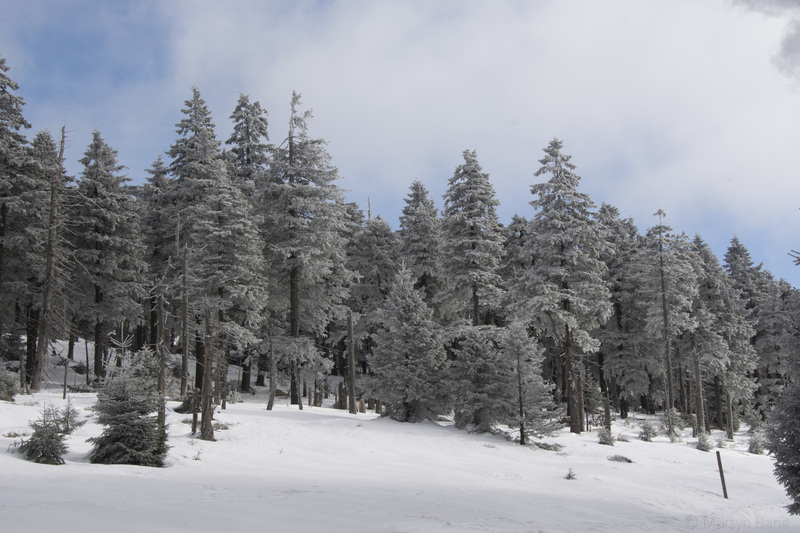 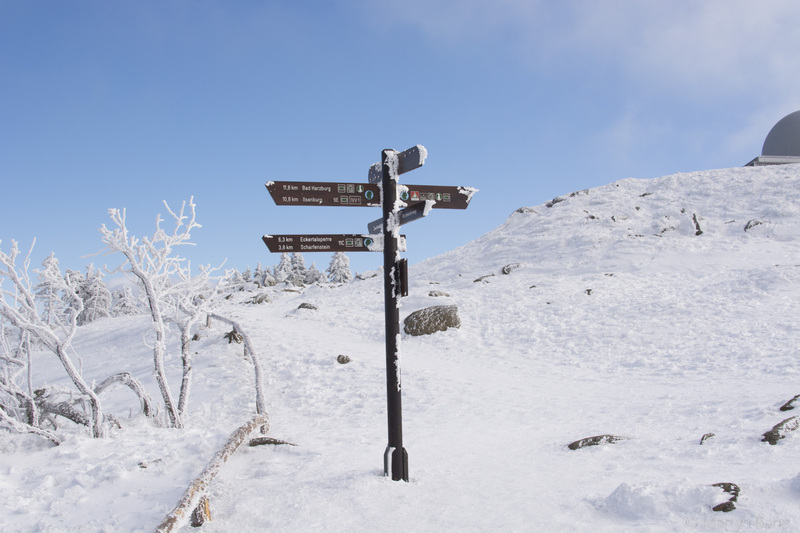 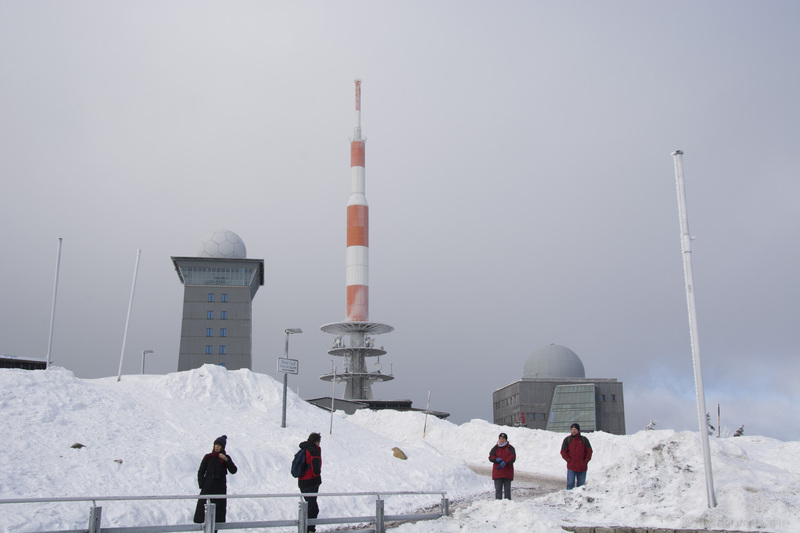 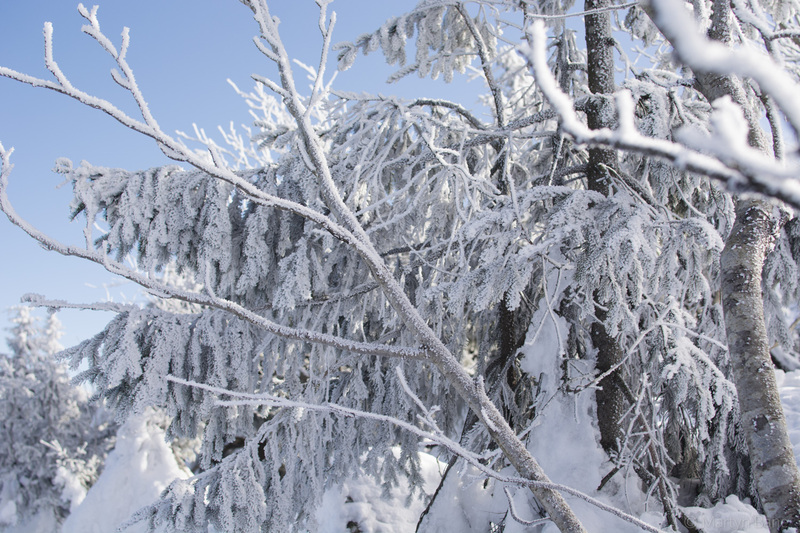 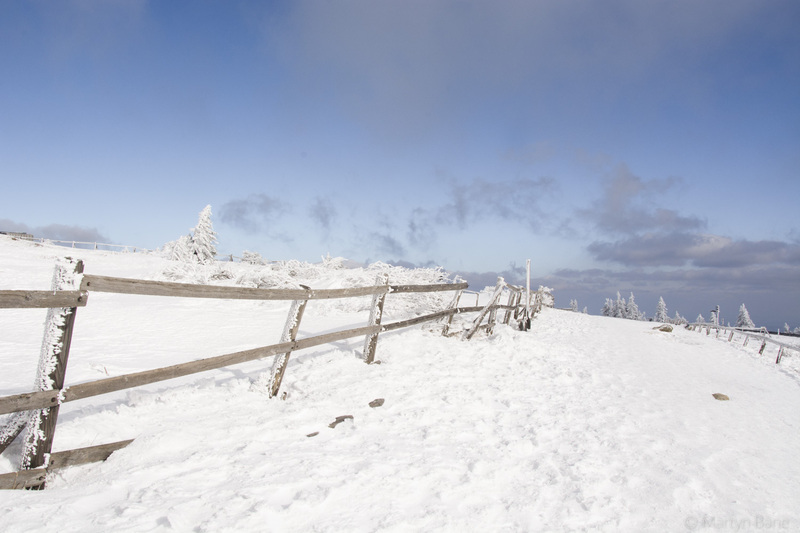 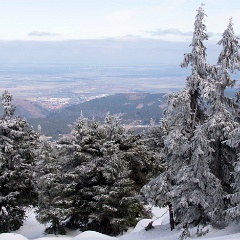 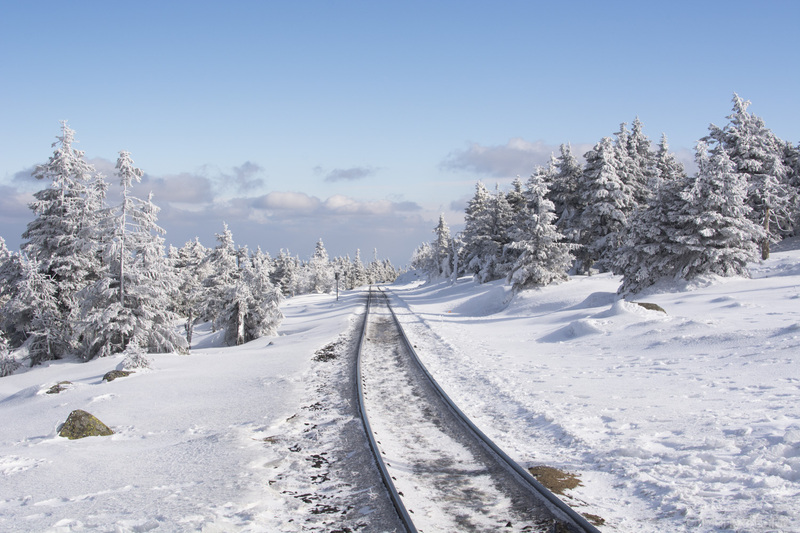 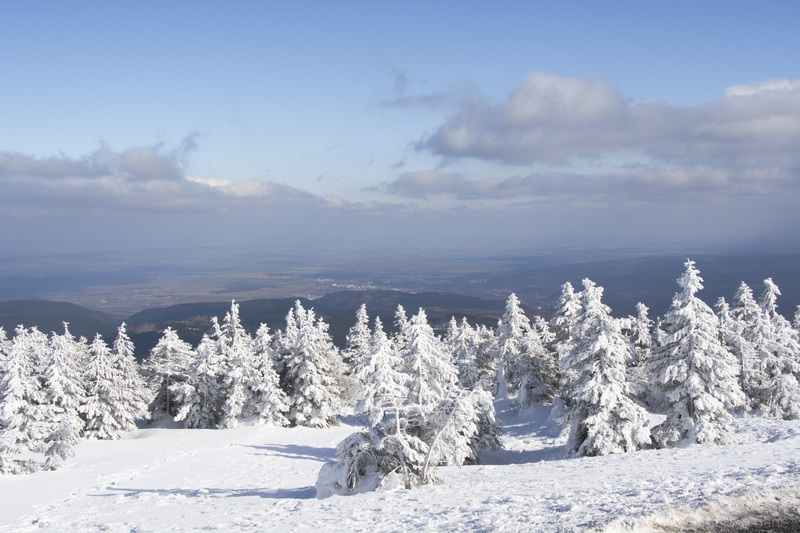 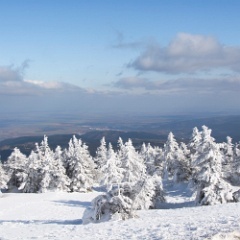 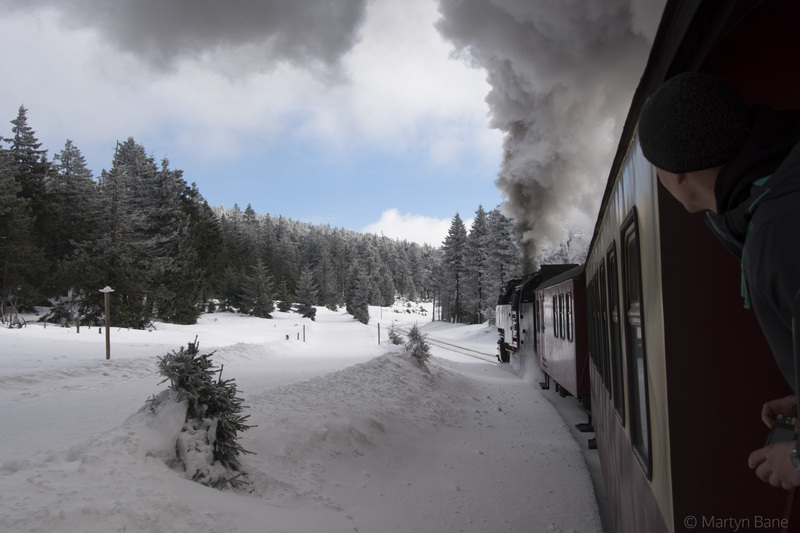 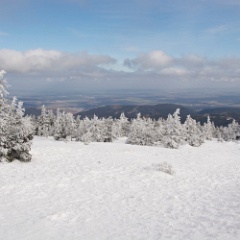 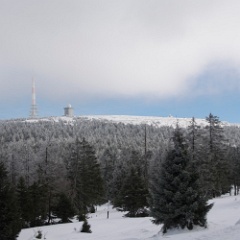 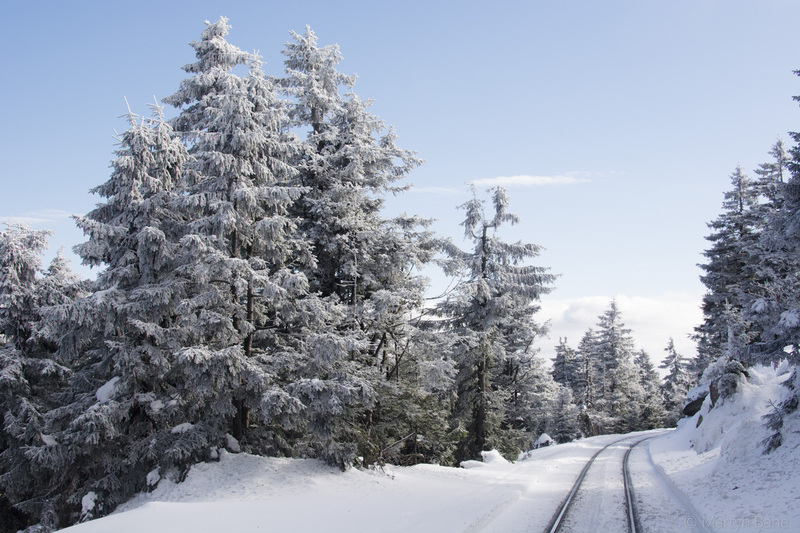 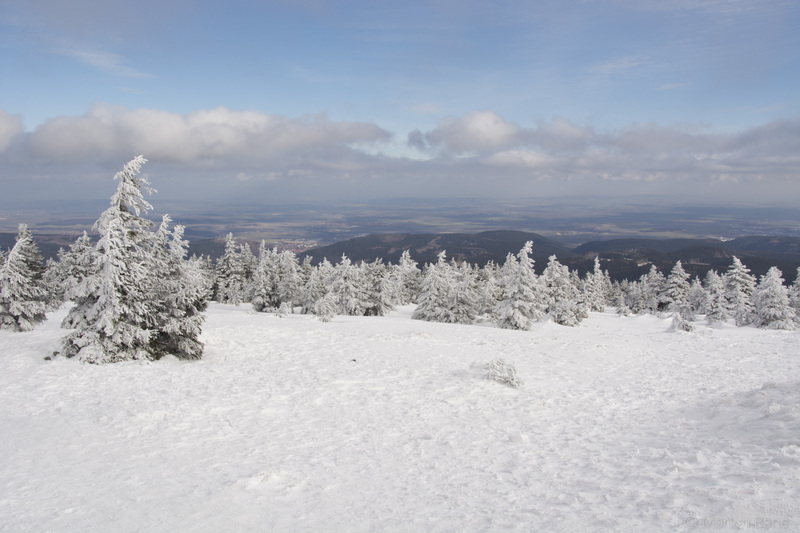 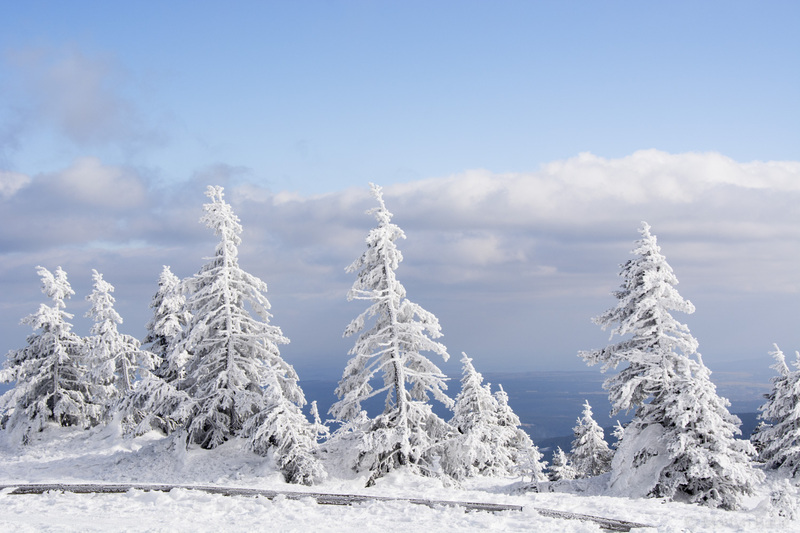 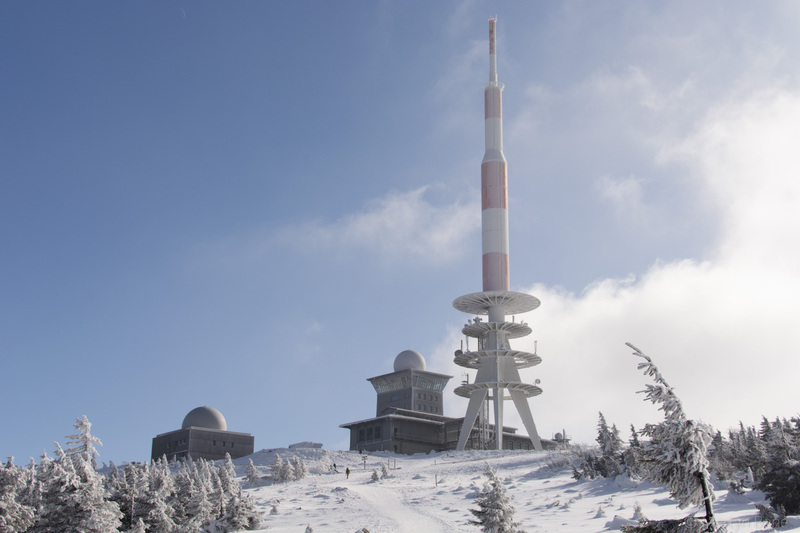 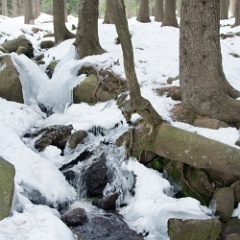 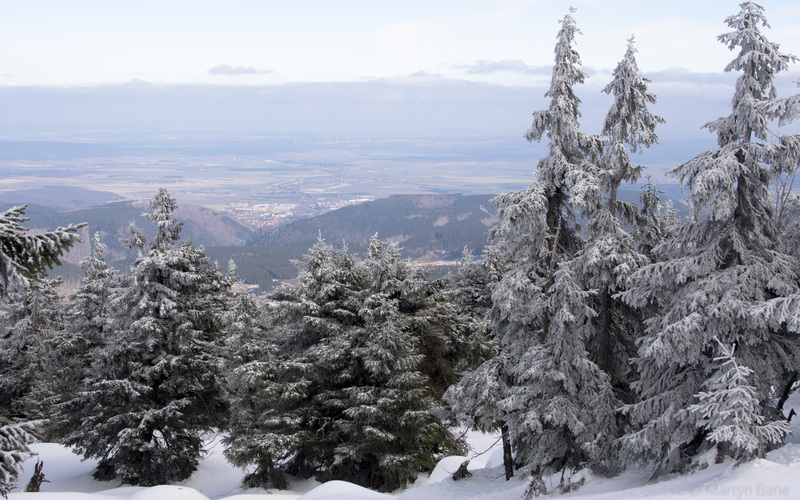 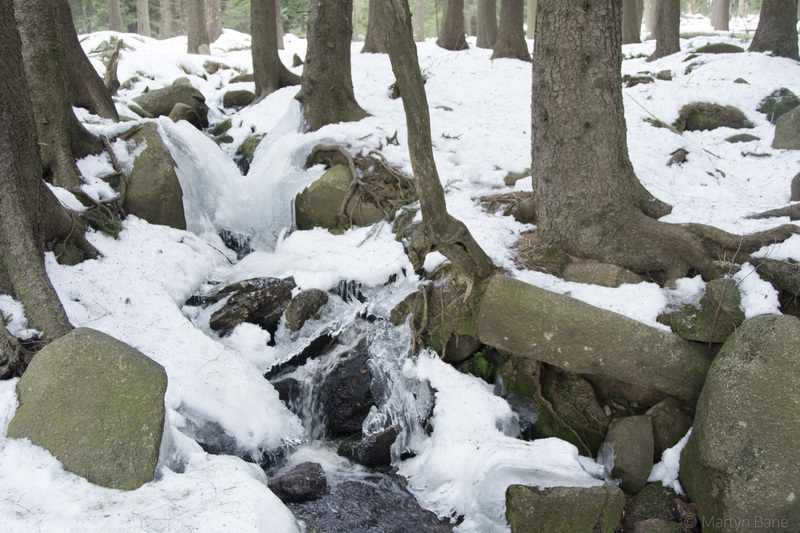 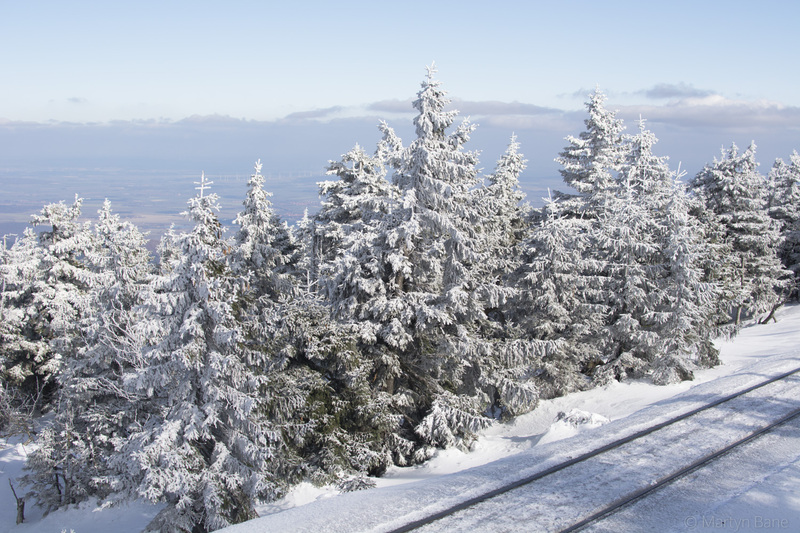 A day taking photos between Drei Annen Hohne and Brocken. 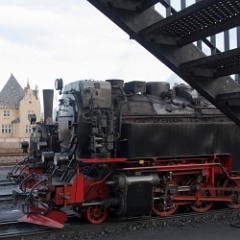 1 99 7240 - an old friend from visits in 1996 and 1998 - sits on shed ready for duty. 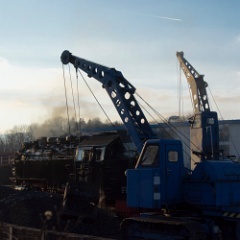 2 Harz Camel 199 861 shunting at Wernigeorde. 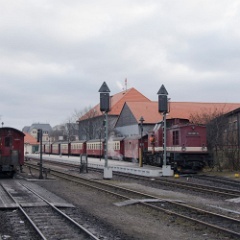 3 Having put a set of carriages in the station 199 861 heads off. 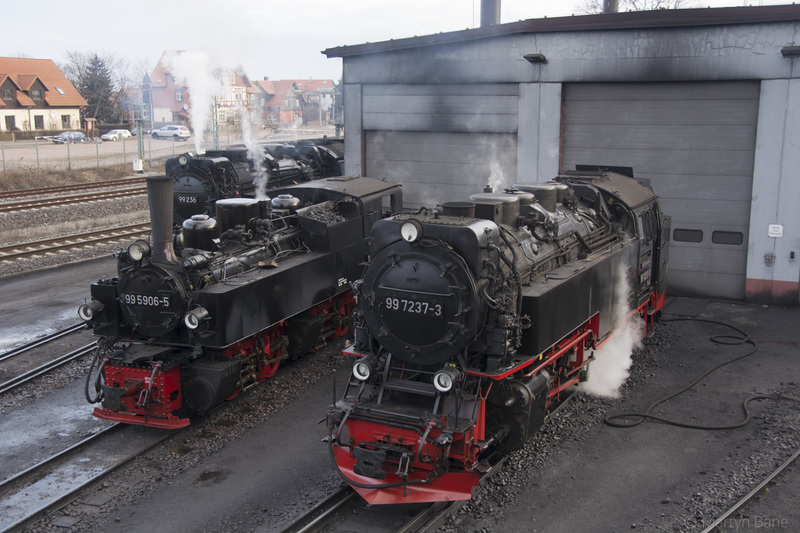 4 99 7237 and 99 5906 at Wernigerode shed. 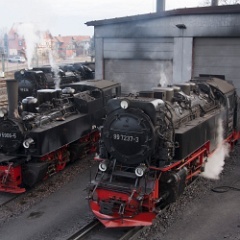 5 99 7237, 99 5906 and 99 236 on shed at Wernigerode. 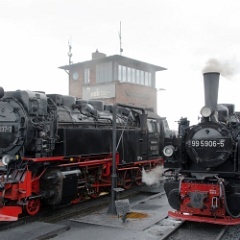 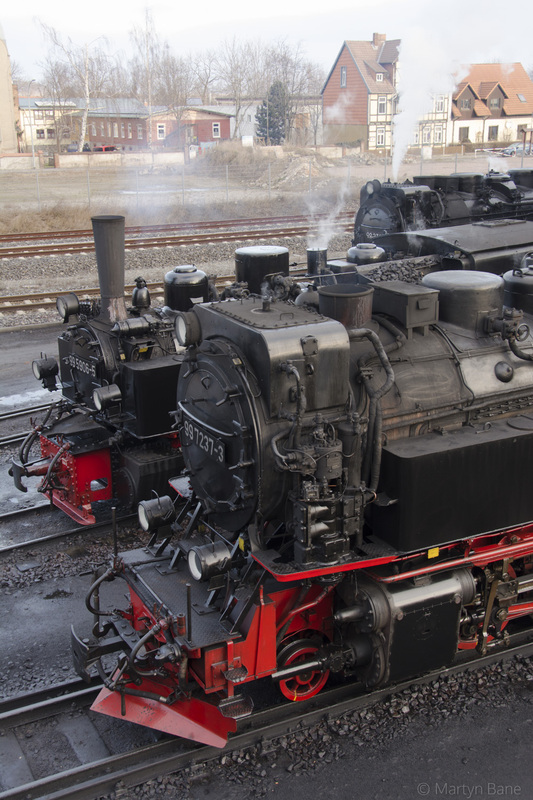 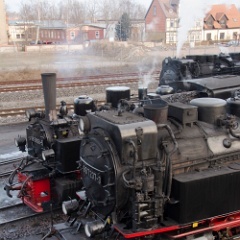 6 2 2-10-2s and a 0-4-4-0 at Wernigerode. 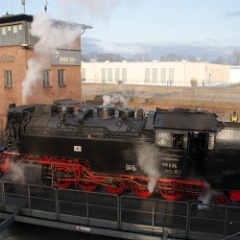 7 99 236 moves off. 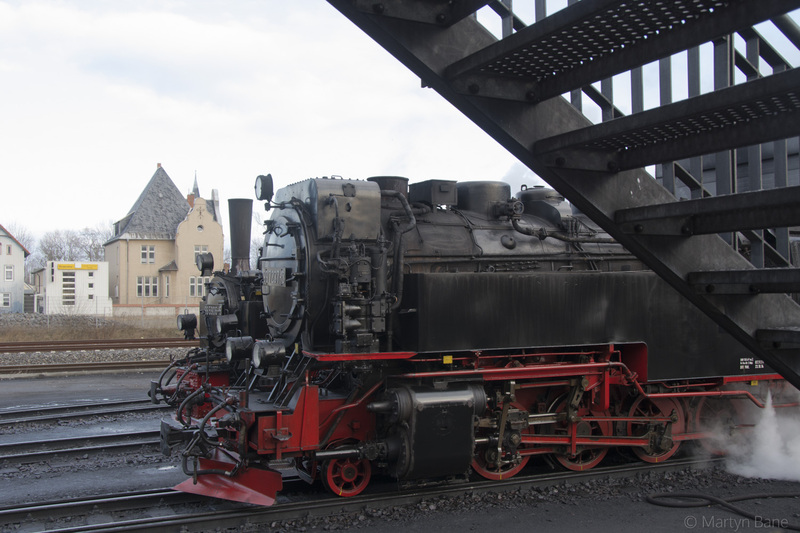 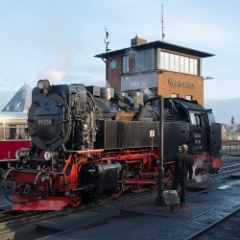 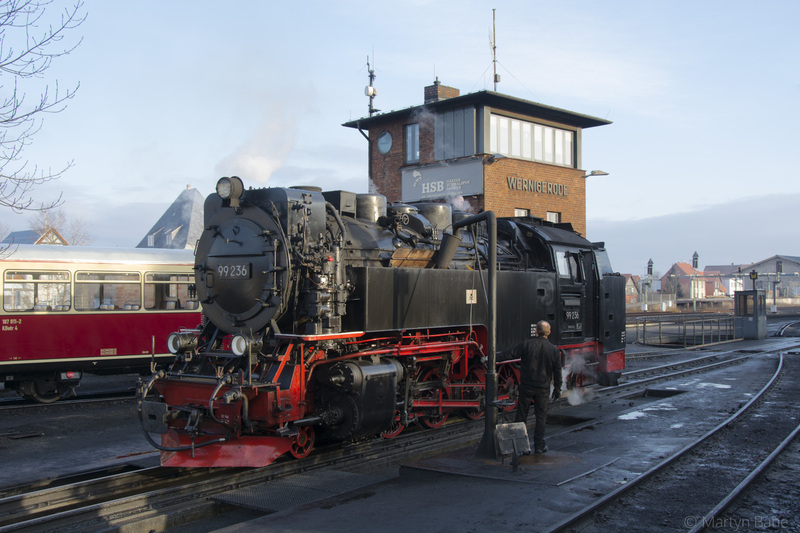 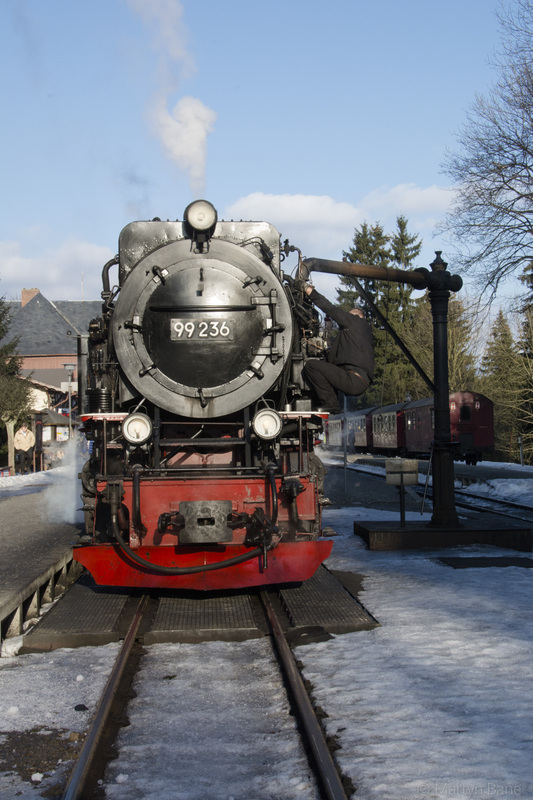 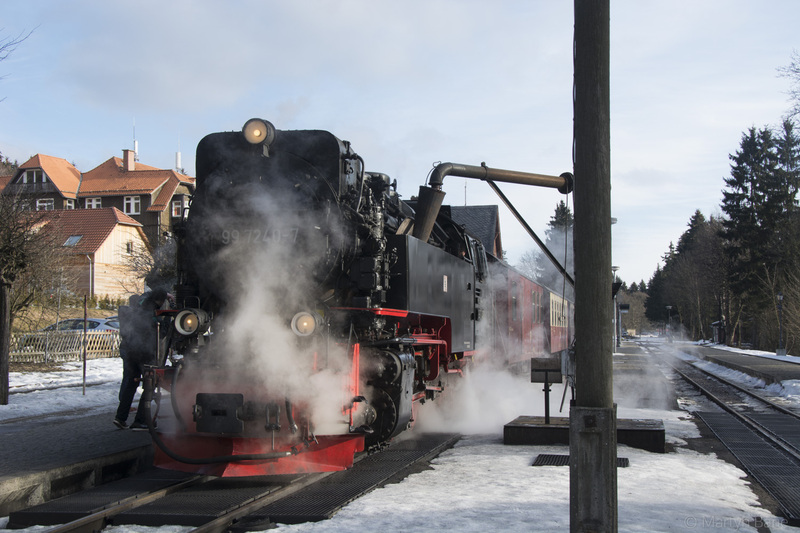 8 99 236 on the turntable at Wernigerode. 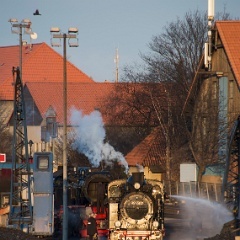 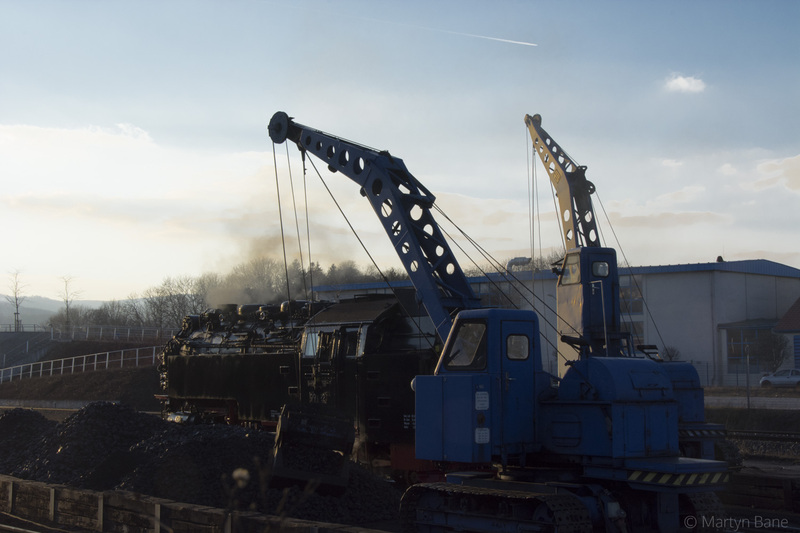 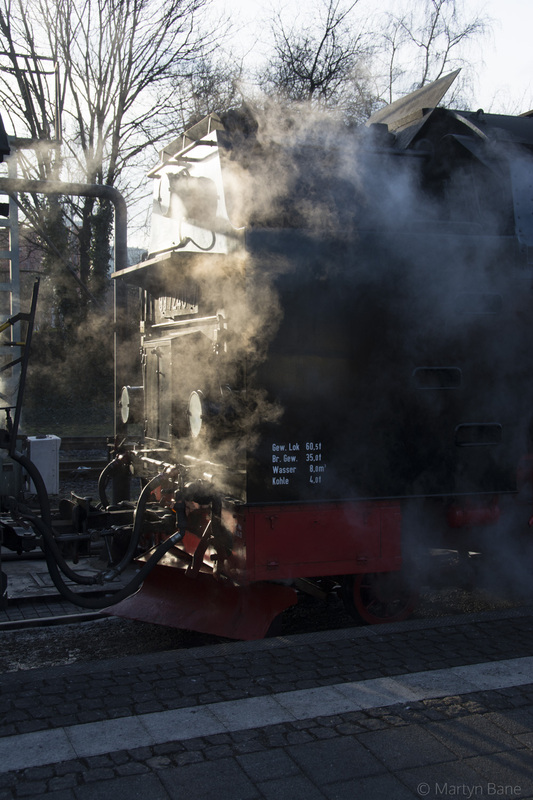 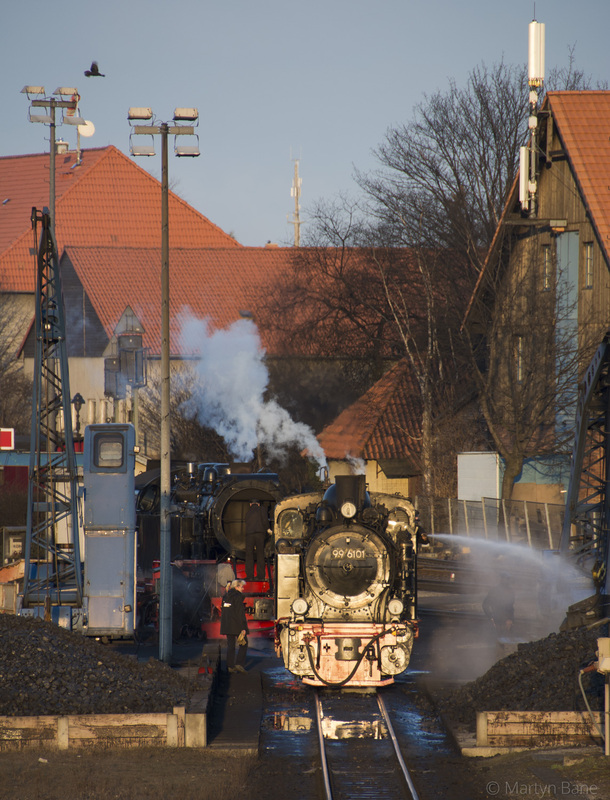 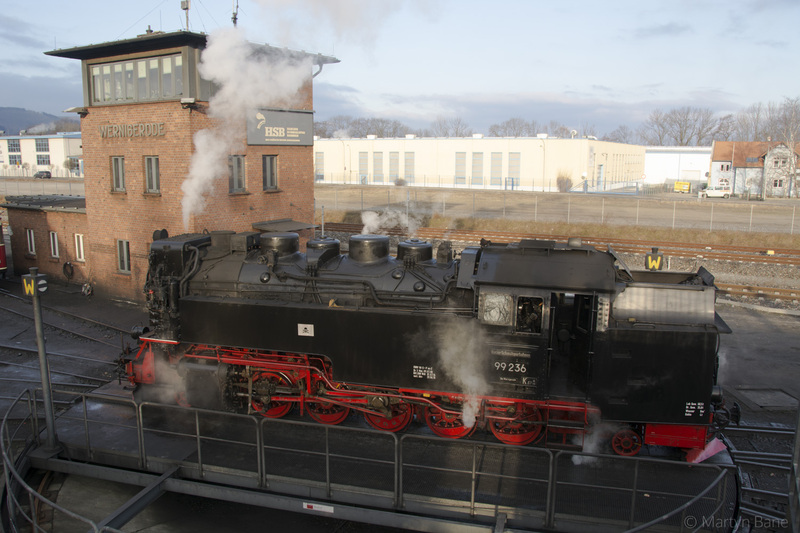 9 99 236 taking water at Wernigerode depot. 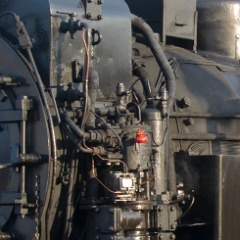 10 Not sure why there was a red duck on the feedwater pump of 99 236. 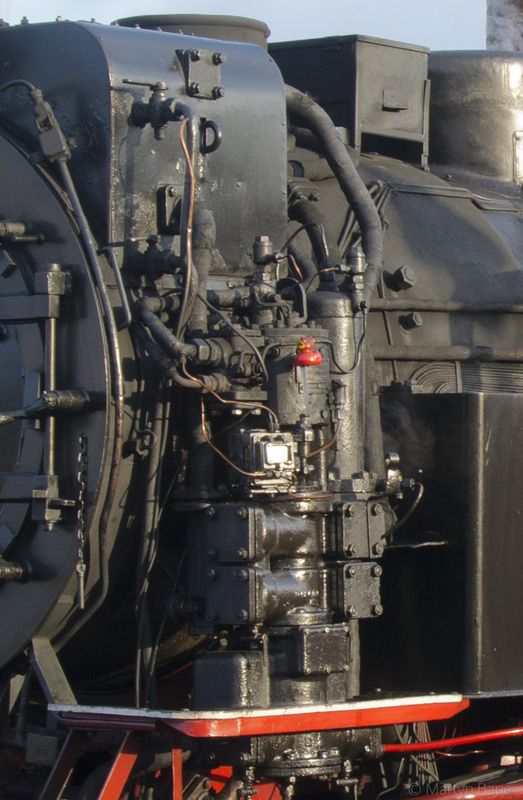 Some might say it was inappropriate! 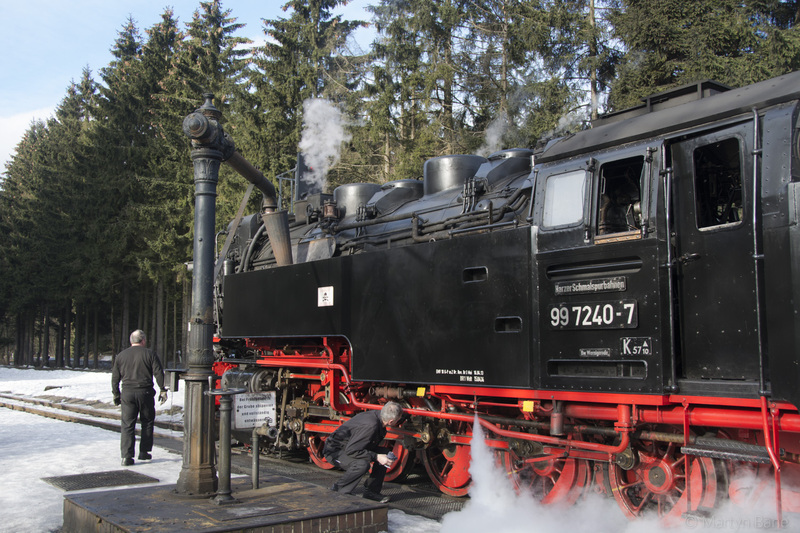 12 99 7240 takes water at Drei Annen Hohne. 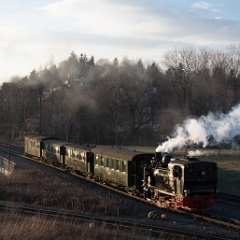 13 99 7240 with the 08:55 from Wernigerode to Brocken at Drei Annen Hohne. 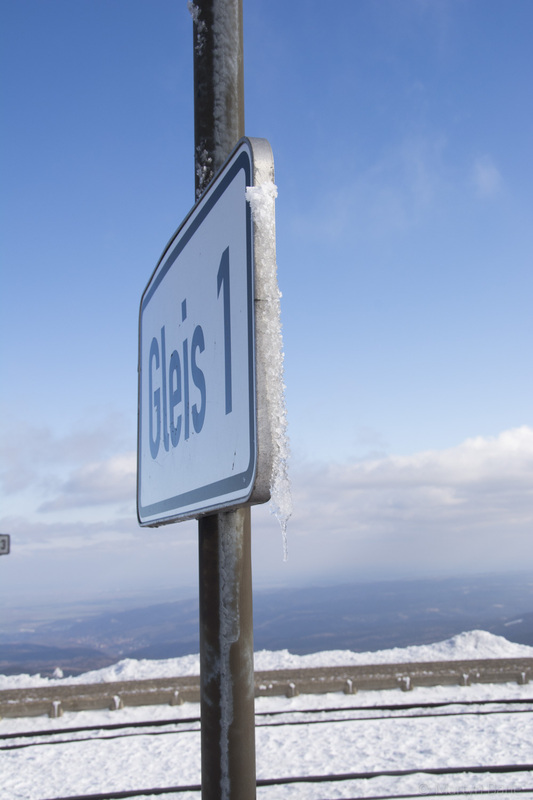 14 Tom at Drei Annen. 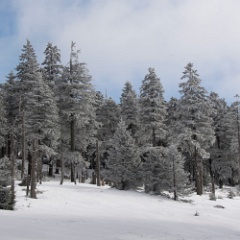 16 Looking promising up ahead. 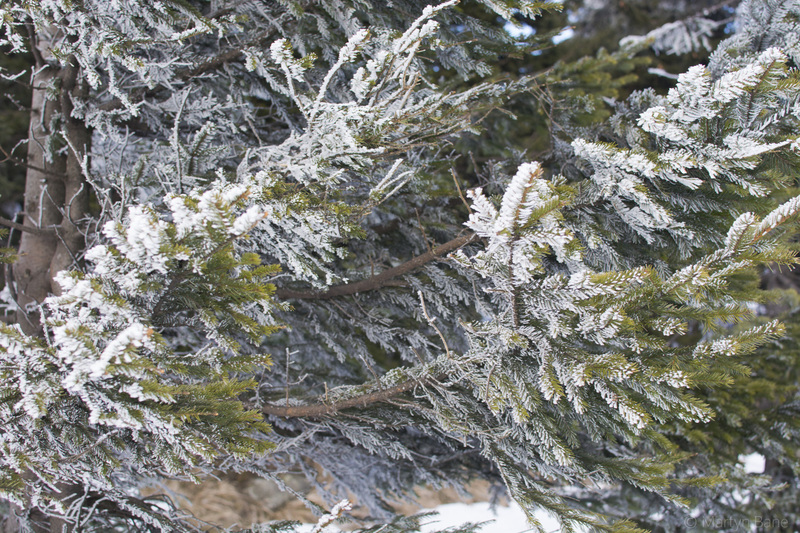 17 It was cold, as the frost in the trees suggests. 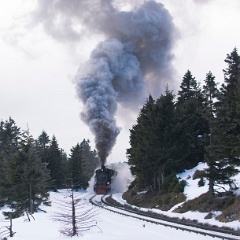 19 99 7240 at Brocken with something approaching a view visible at last. 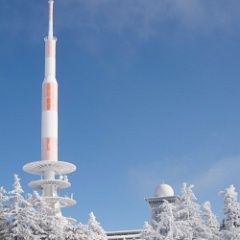 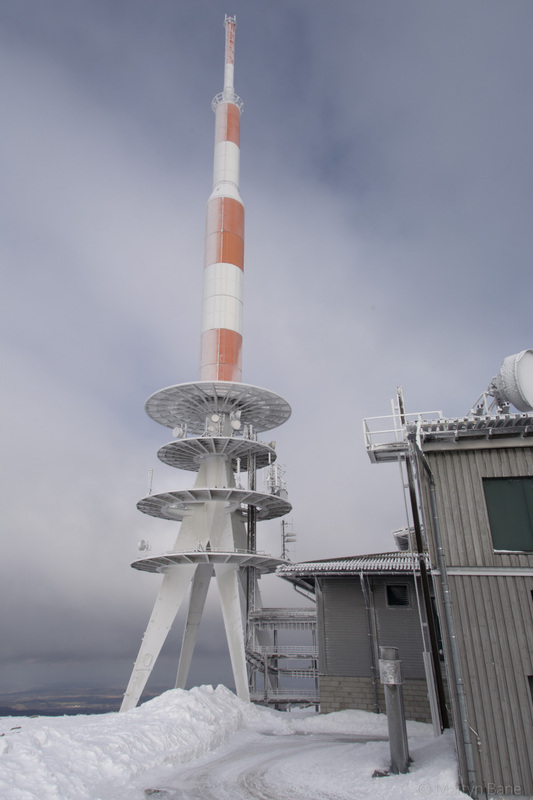 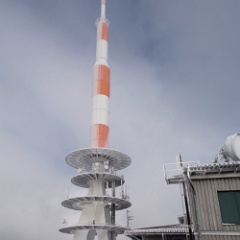 20 At the top of the Brocken. 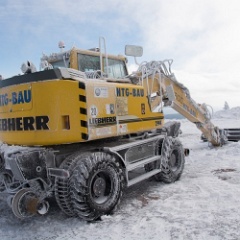 21 An essential bit of kit. 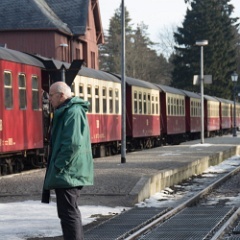 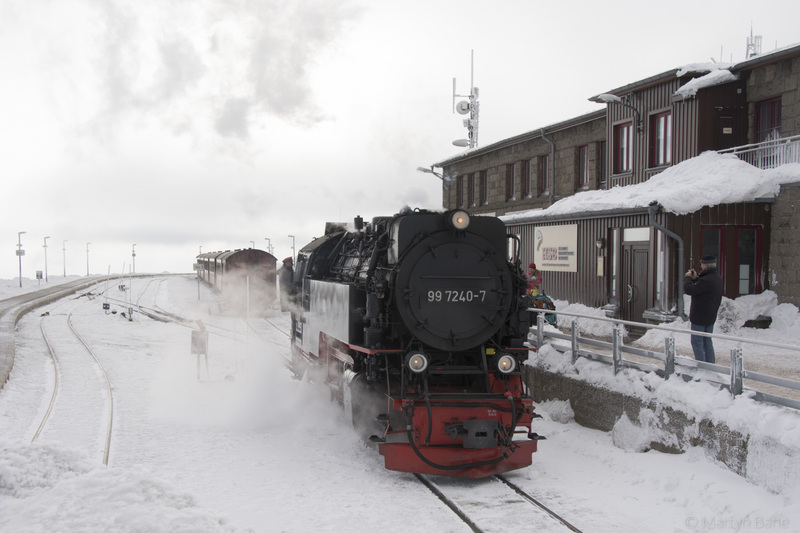 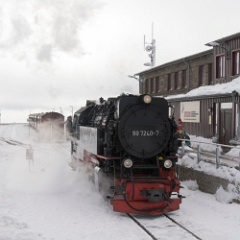 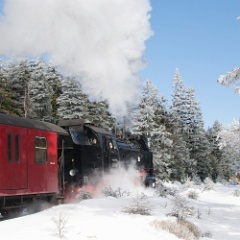 22 99 7240 at Brocken. 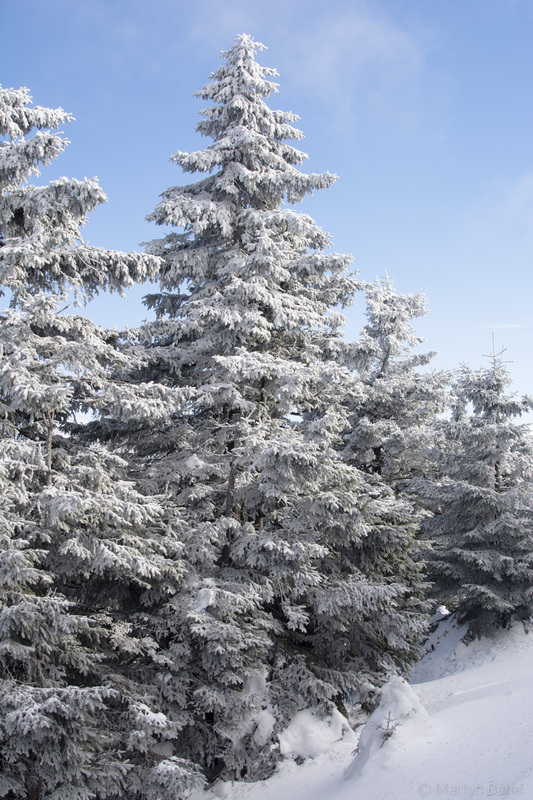 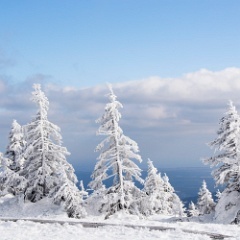 23 Snow in the trees and a view! 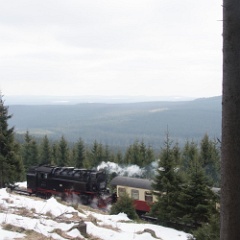 24 99 7240 runs-round at Brocken. 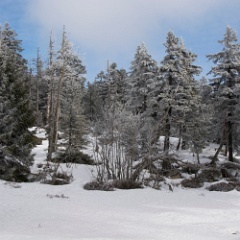 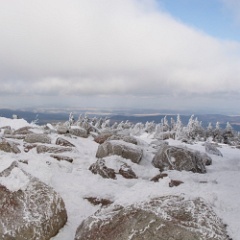 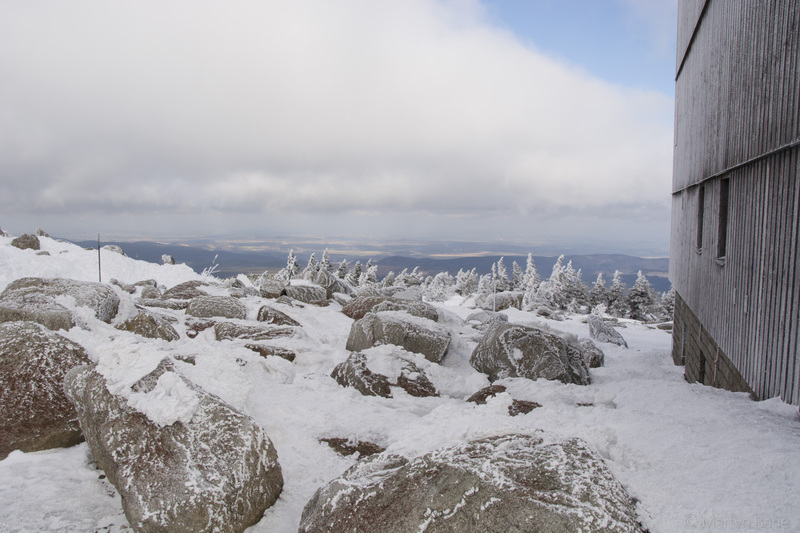 25 Snow and frosty rocks on the Brocken. 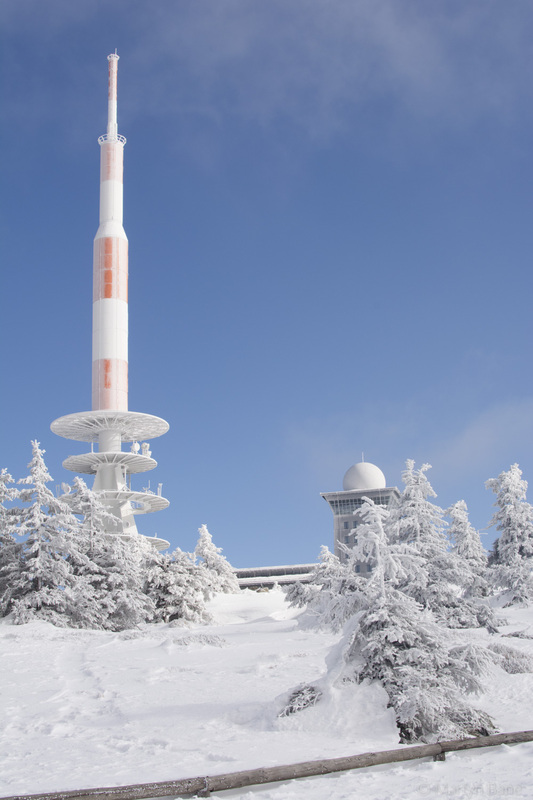 26 The TV transmitter in the colours that are so reminiscent of Communist times. 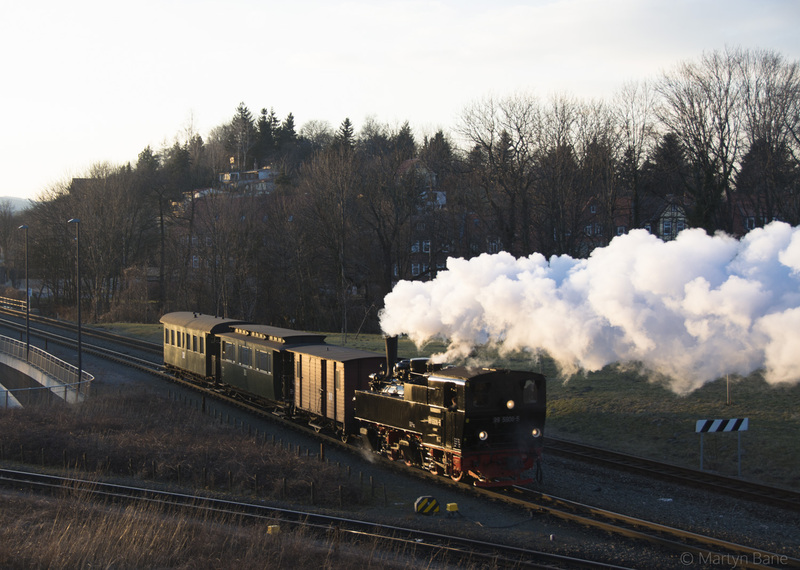 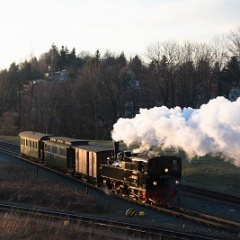 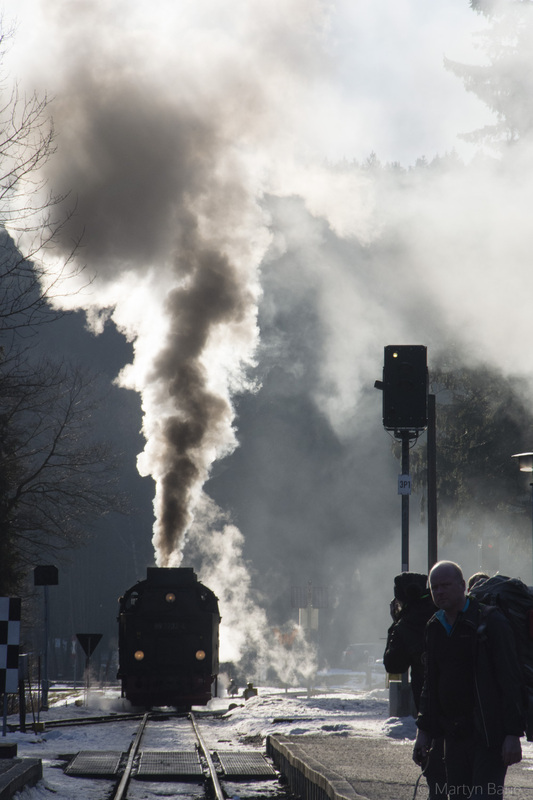 27 Just after the sun had gone in..... 99 236 climbs the last kilometer or so to Brocken with the 09:40 from Wernigerode. 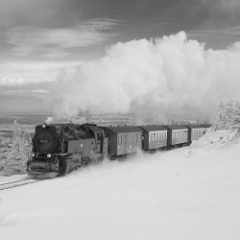 28 Alternatively 99 236 and train in black & white. 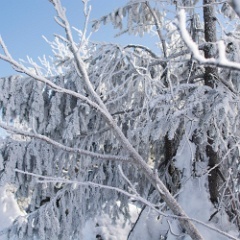 29 Snow in the trees. 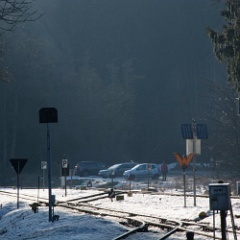 30 Ilsenburg is down below the trees and hills. 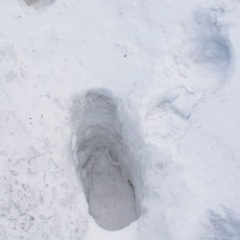 32 The path the HSB snow blower cuts is clear, the rest is undisturbed. 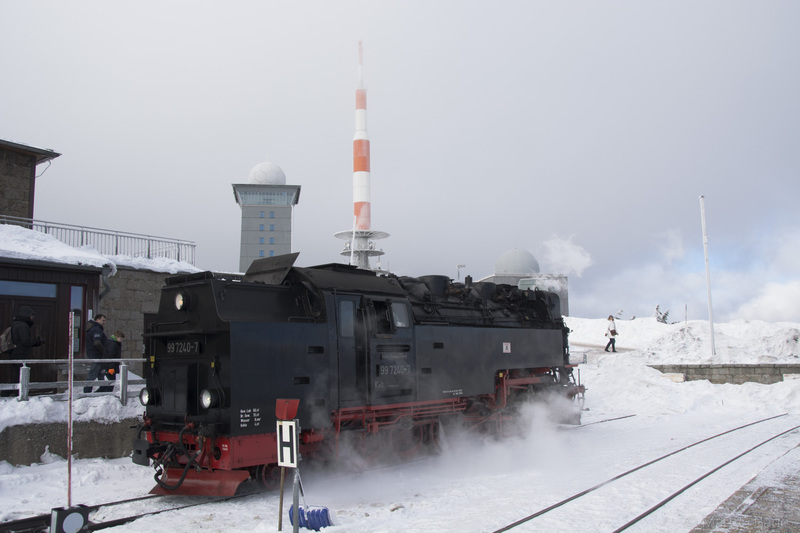 33 99 236 drops down from Brocken with the 10:51 to Drei Annen Hohne. 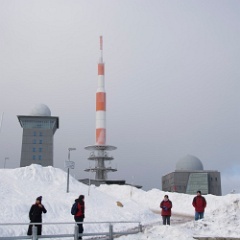 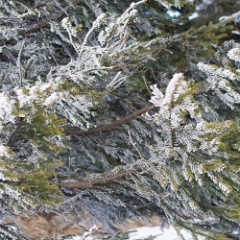 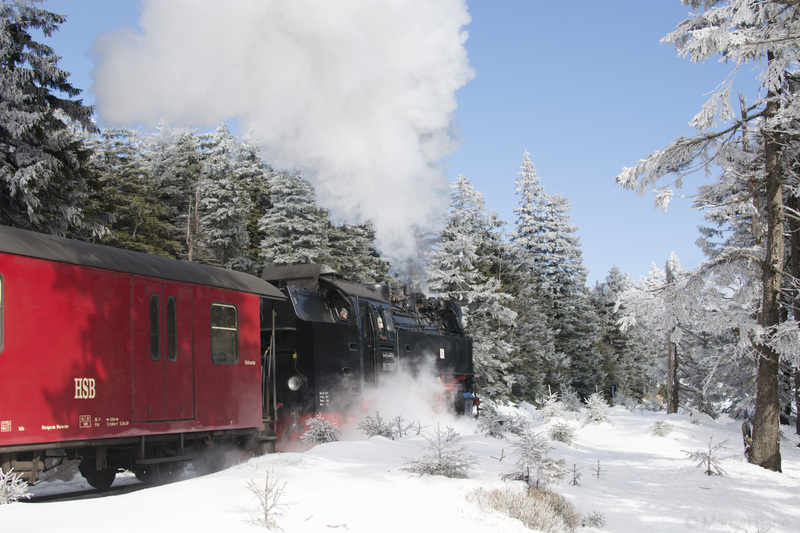 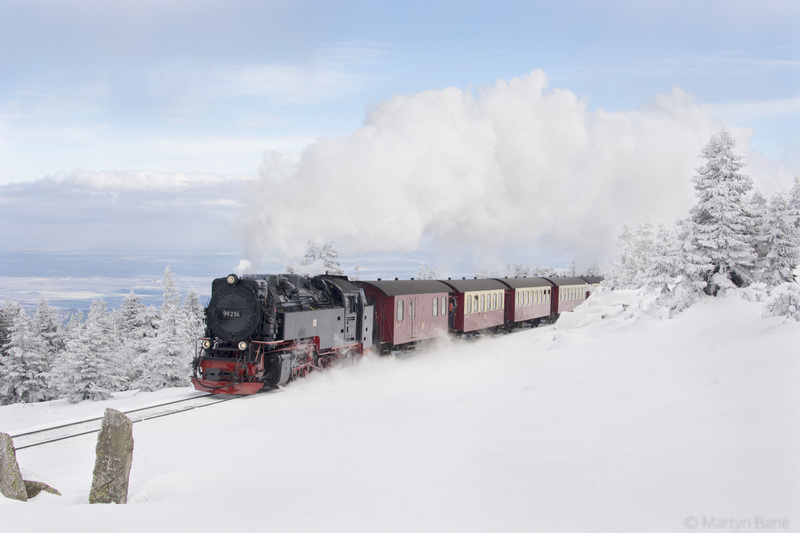 34 Typical of the scenes on the Brocken. 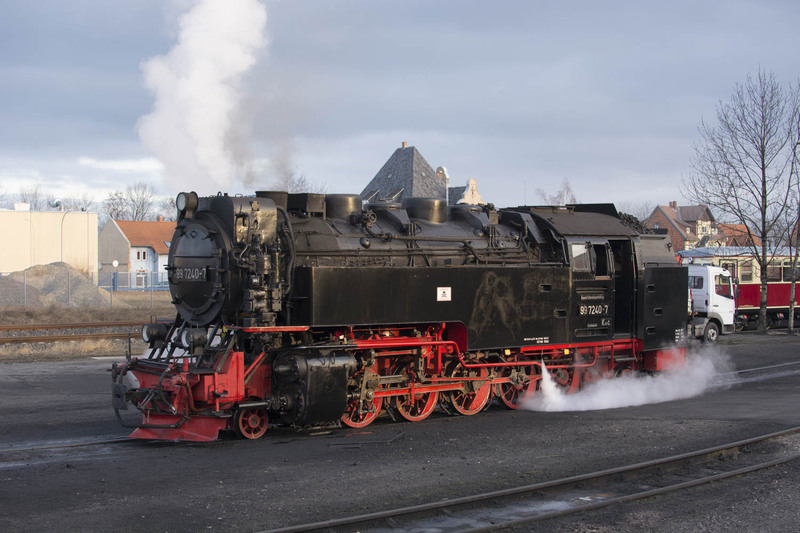 36 99 222 in the sun! 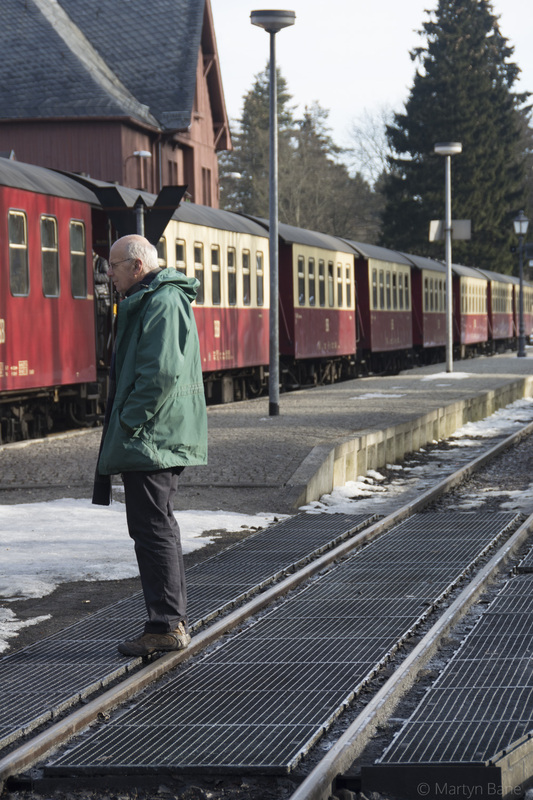 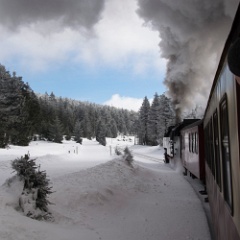 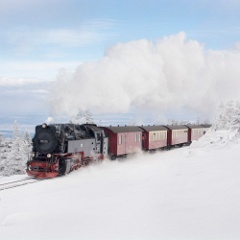 This is the 10:25 from Wernigerode. 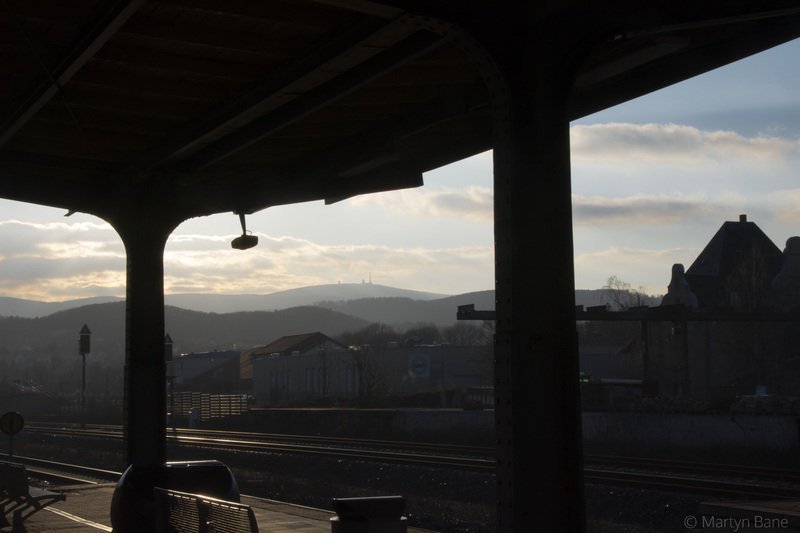 37 And just to illustrate the power of digital photography here's one the camera got massivley wrong - unless your thing is high key photography. 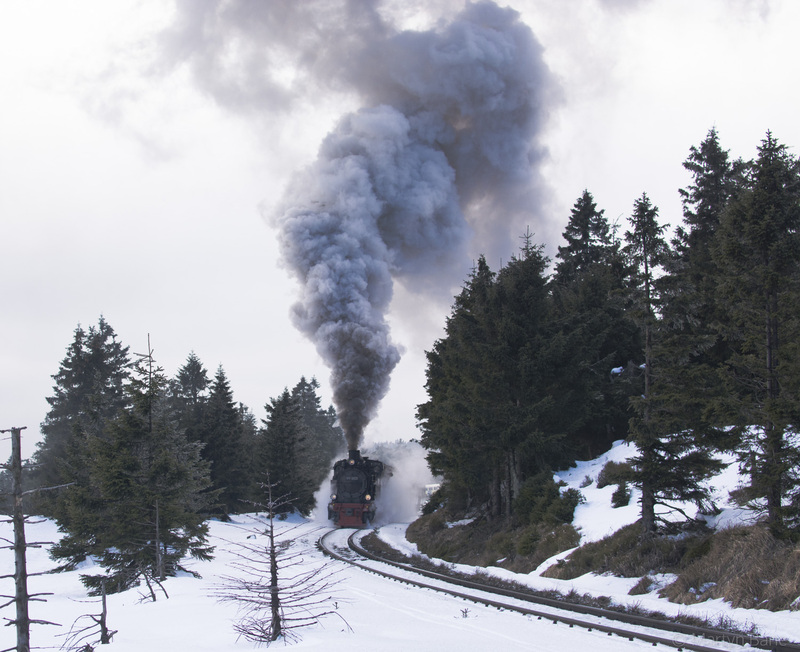 38 After about minute's editing this is the result, one rescued shot. 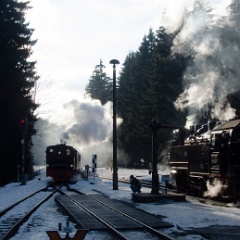 If only I could do this with the over-exposed slides I have in my collection! 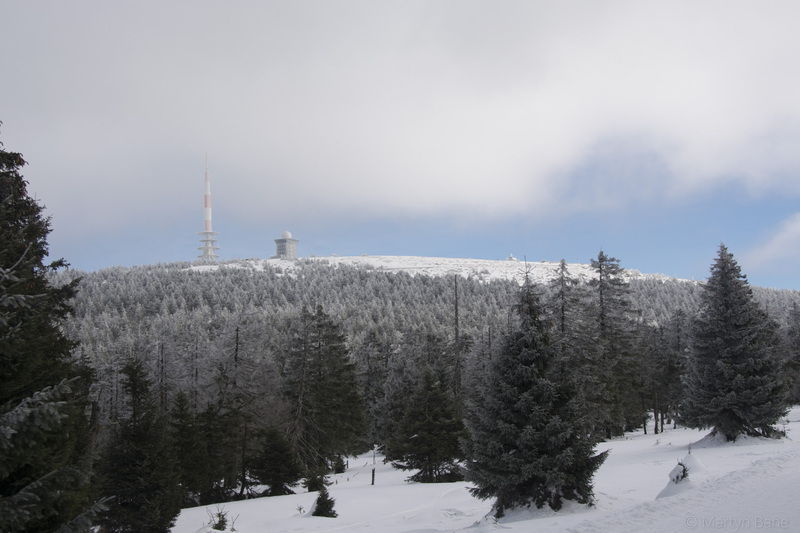 39 Threatening clouds which hung to the west of the Brocken occasionally blowing across the sun to give the photogrpaher grief! 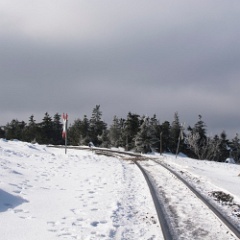 This is at the crossing of the HSB and the Ilsenburg trail below the summit. 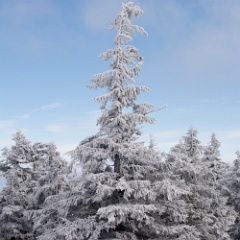 40 Looking up to the summit from the Ilsenburg trail. 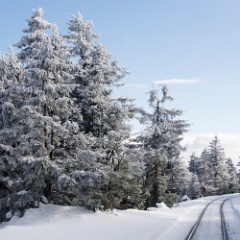 41 Looking down hill, magical. 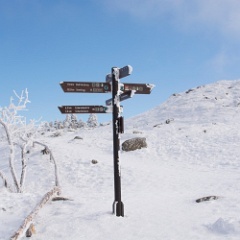 42 Plenty of walking options. 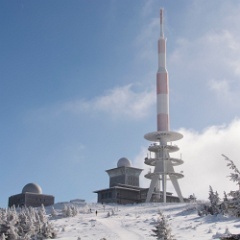 43 TV transmitter and Communist era buildings. 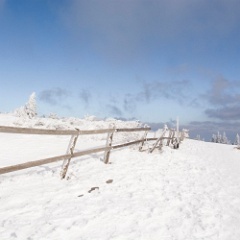 44 On the circular walking track around the summit. 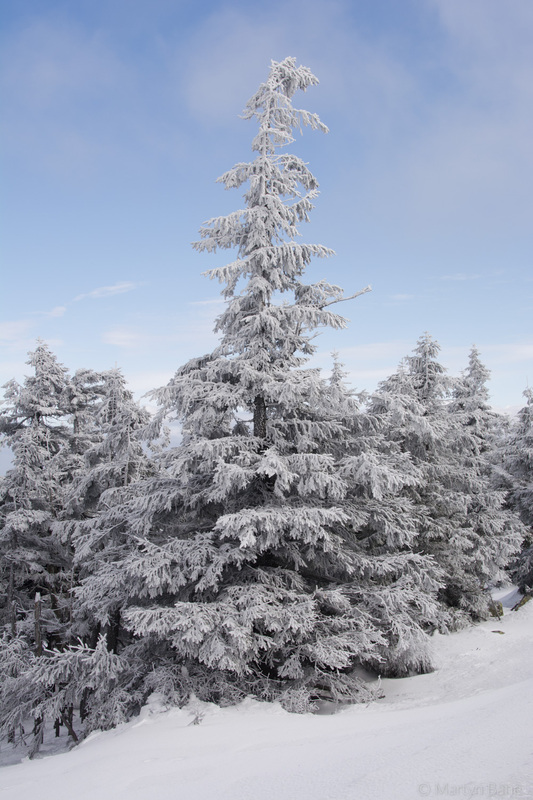 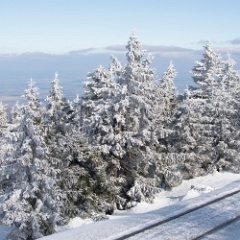 45 More put upon trees on the Brocken. 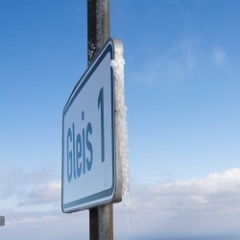 46 An icy gleis 1. 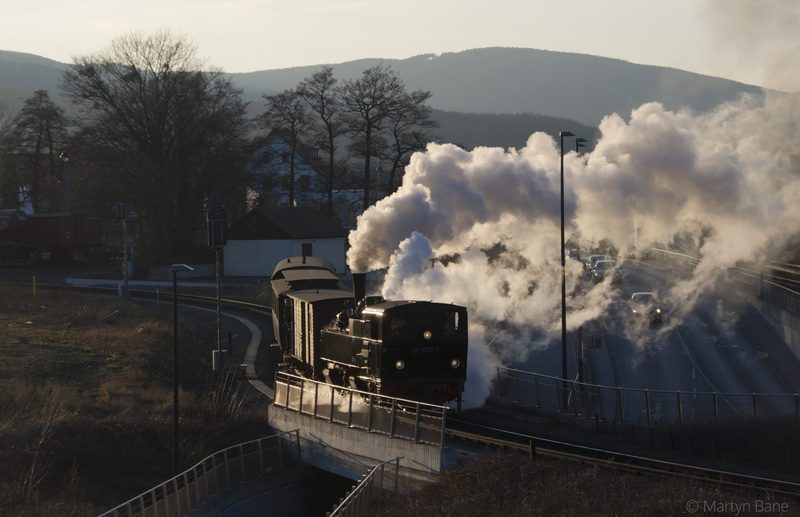 47 Looking down towards Wernigerode. 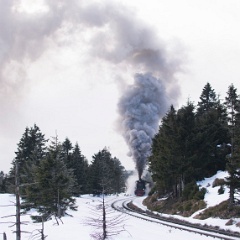 48 99 7240, again, with the 12:00 from Drei Annen Hohne to Brocken with those clouds threatening again. 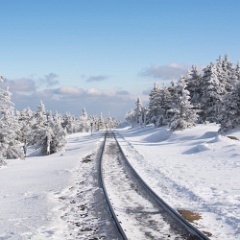 49 And away towards the blue sky. 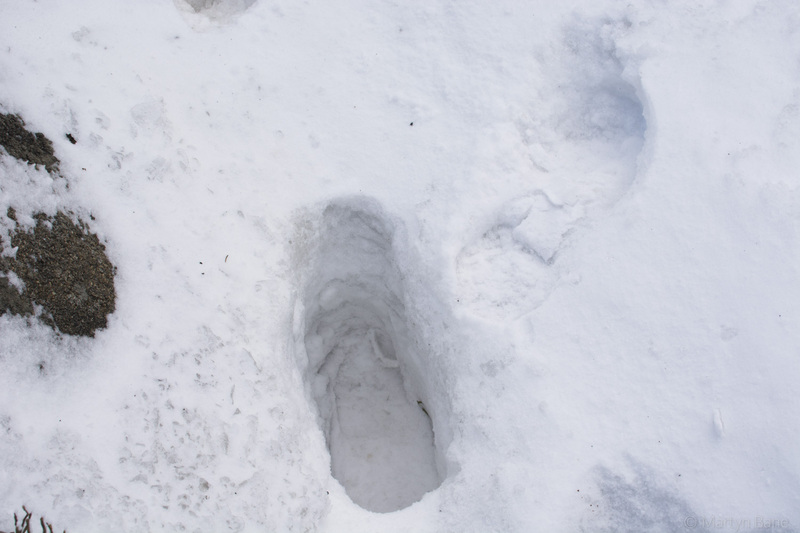 50 A fairly typical example of what the snow did when stood on for any appreciable amount of time! 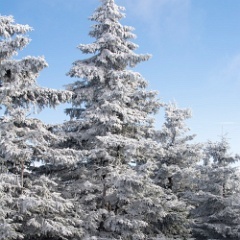 51 More frost in the trees. 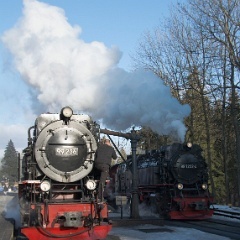 52 A Tradszug hauled by 0-6-0t 99 6101 makes steady progress up the 1 in 30. 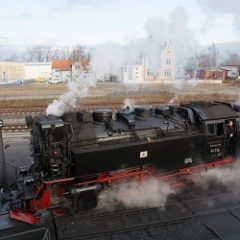 53 99 6101 making a lot of noise with its 4 coach Tradszug. 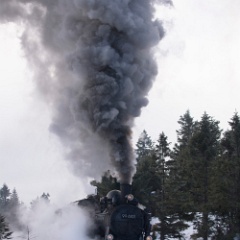 54 And still it comes! 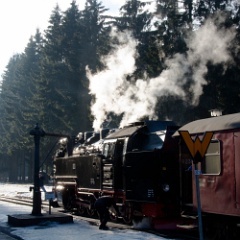 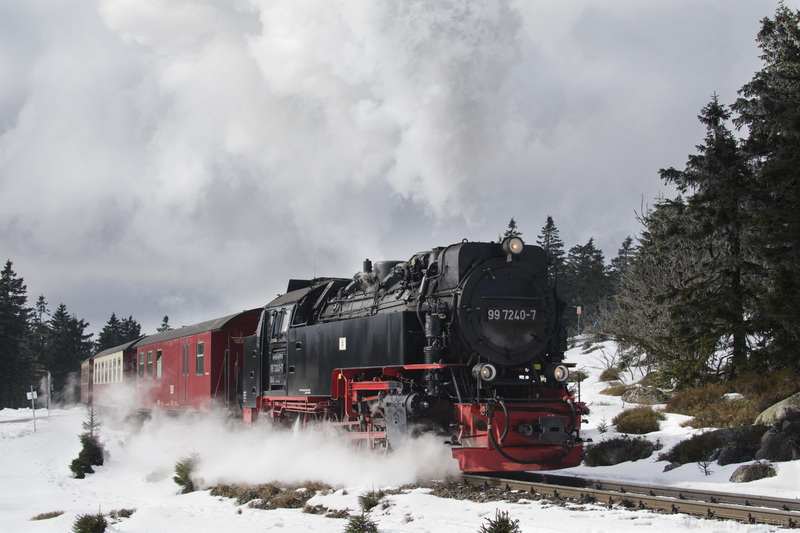 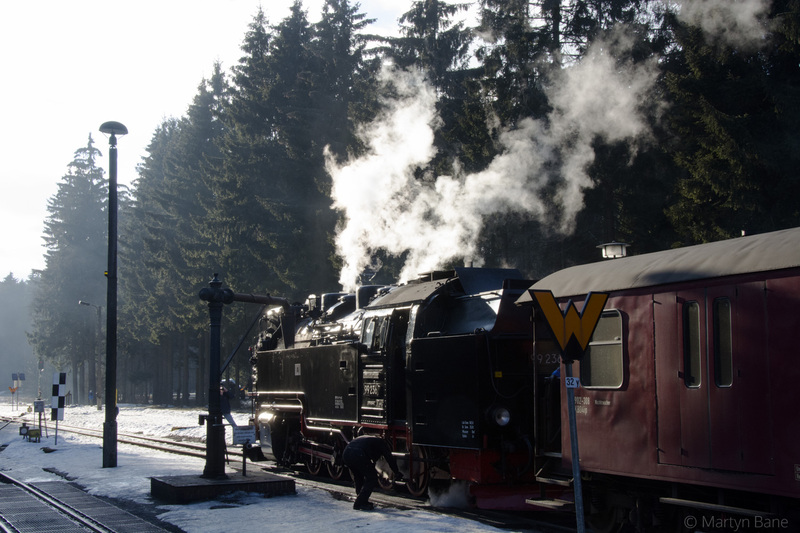 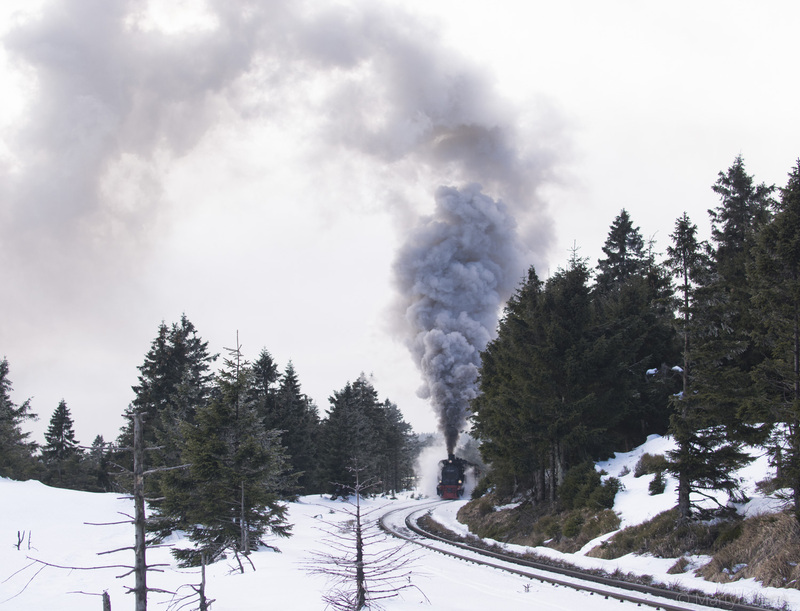 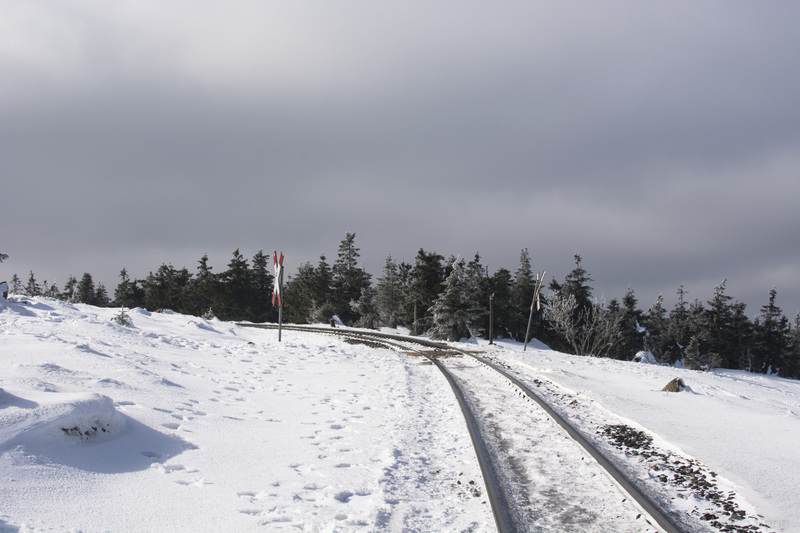 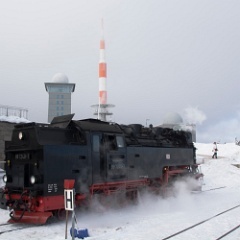 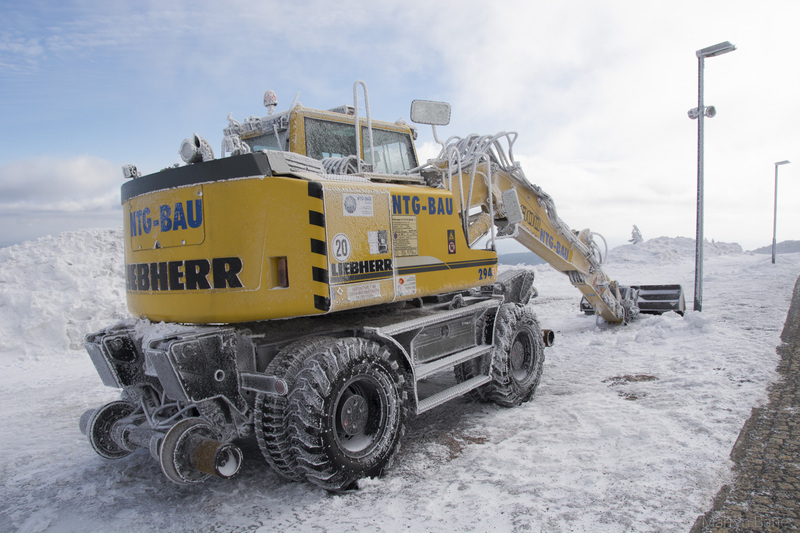 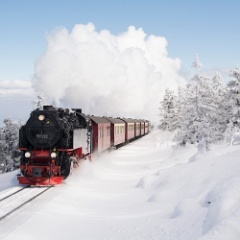 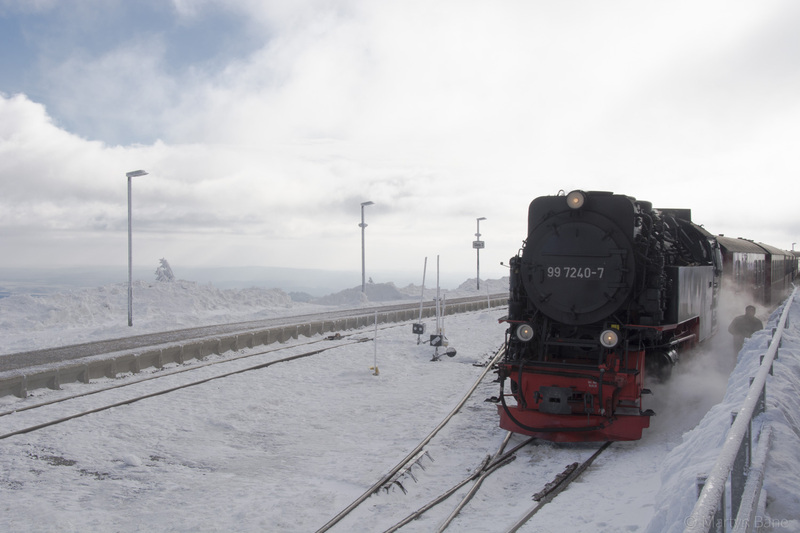 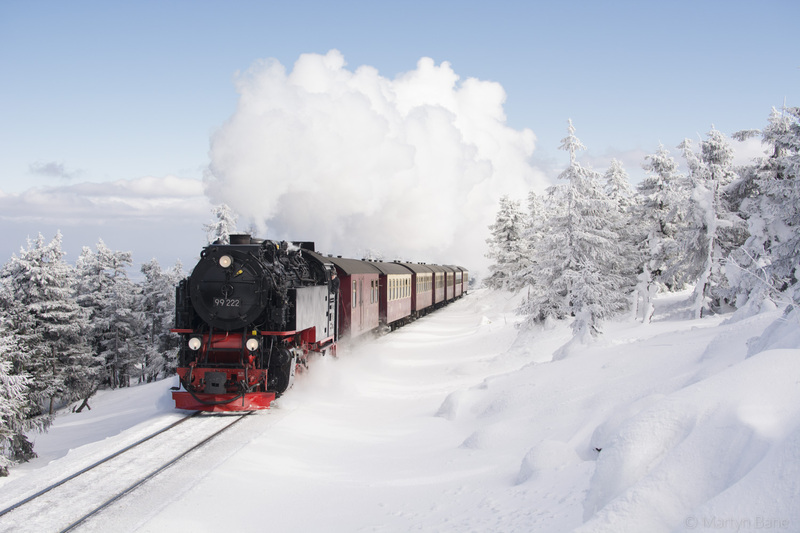 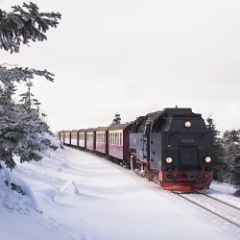 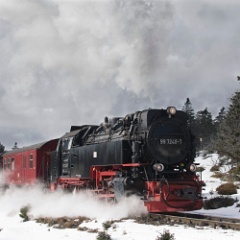 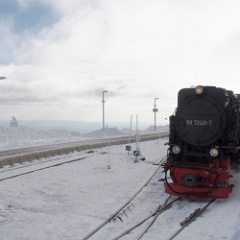 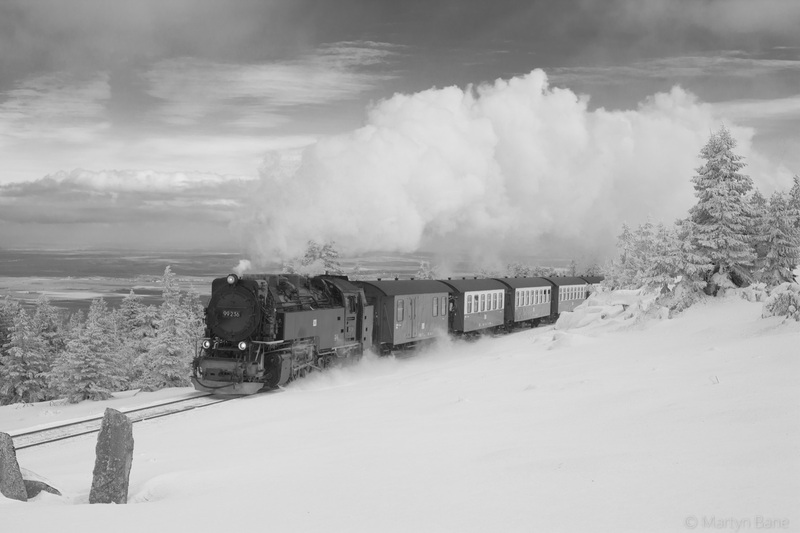 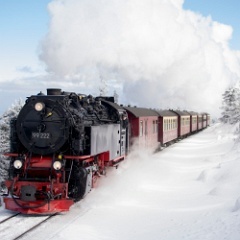 99 6101 on the Brocken. 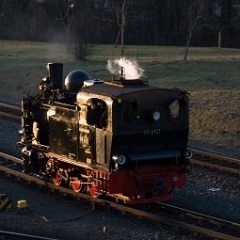 55 I was hoping for a backlit shoot here but the sun didn't play ball. 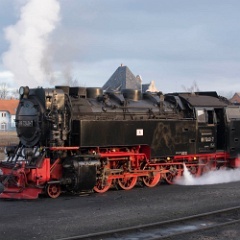 99 6101 made up for it with a spectacular show. 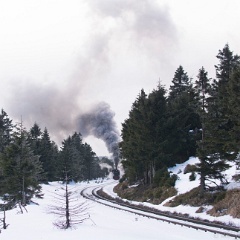 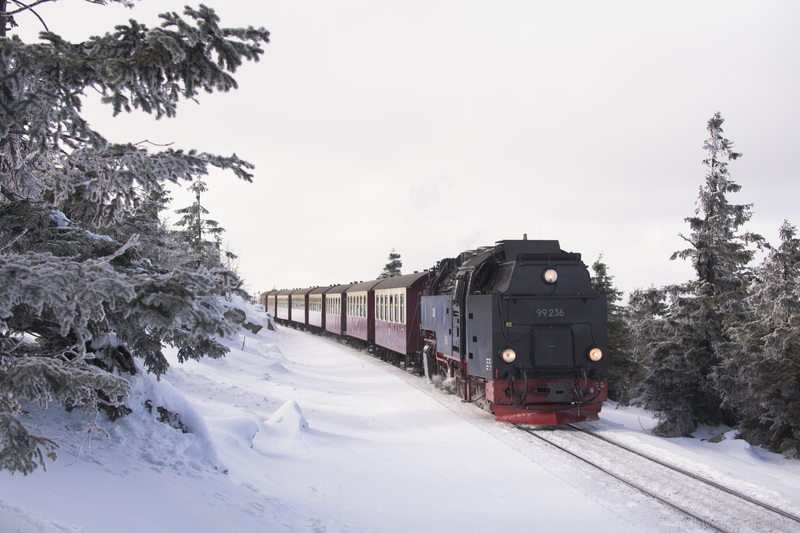 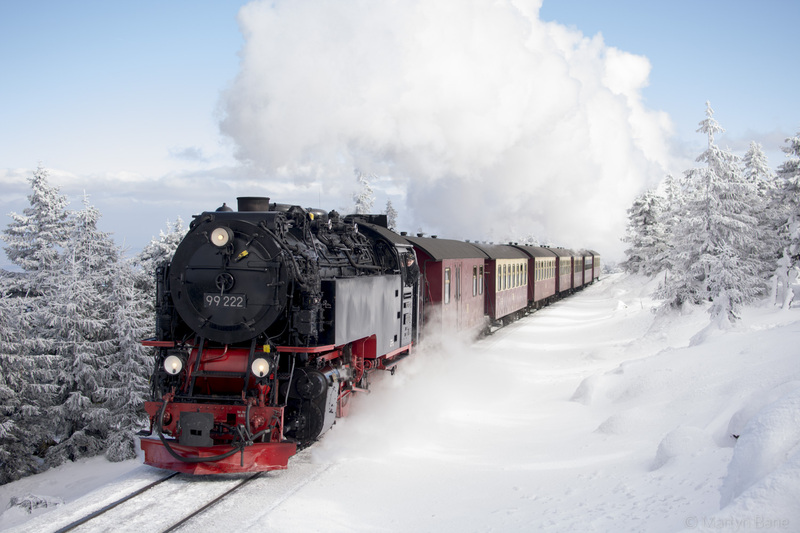 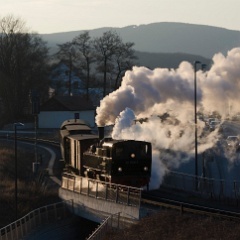 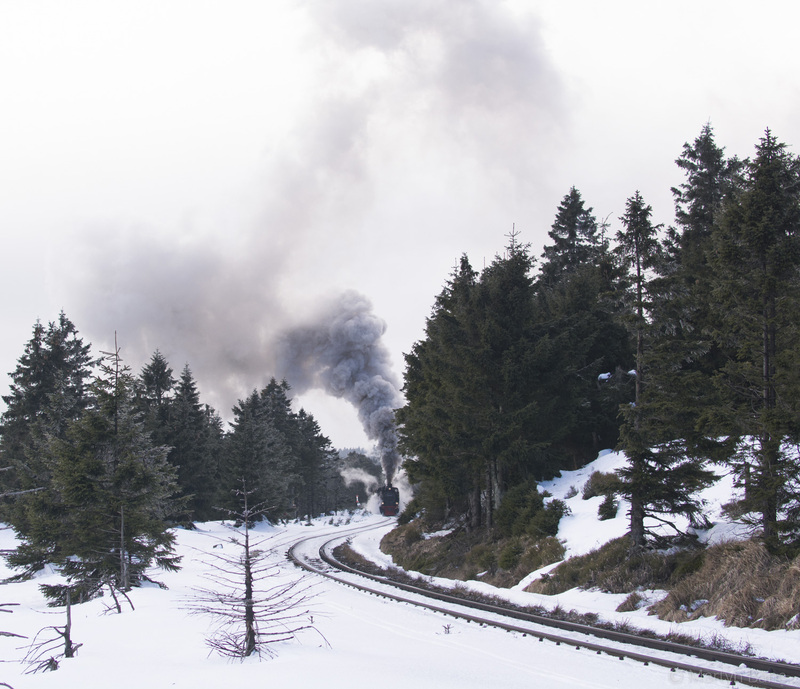 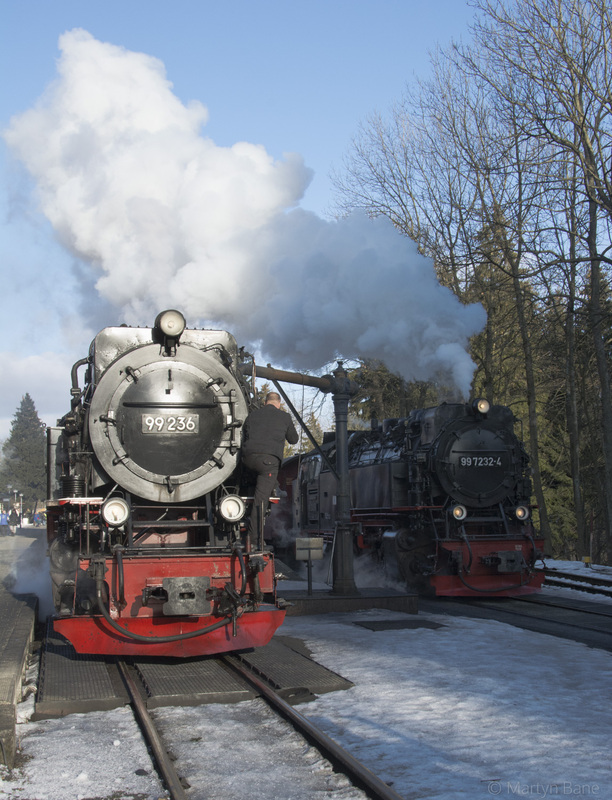 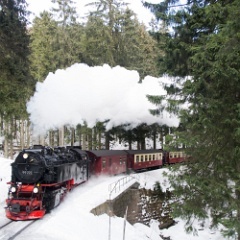 56 99 222 rounds the hair pin Eckerloch Curve with the 13:39 Drei Annen Hohne to Brocken. 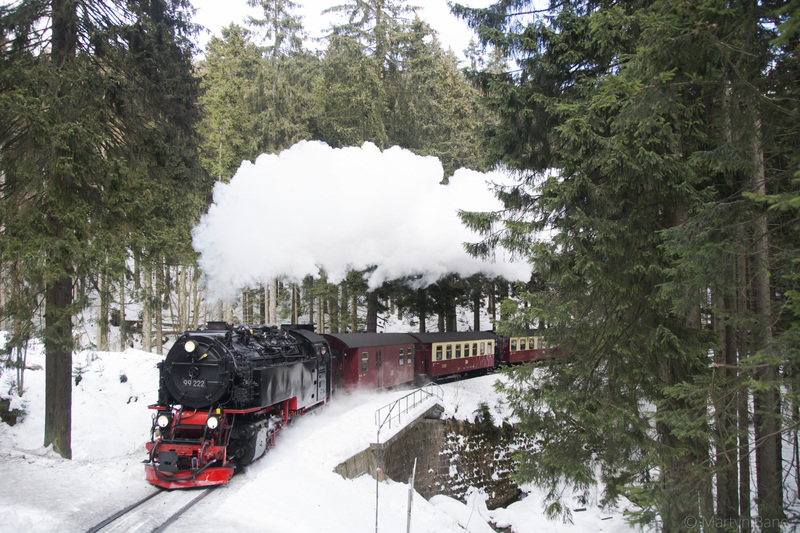 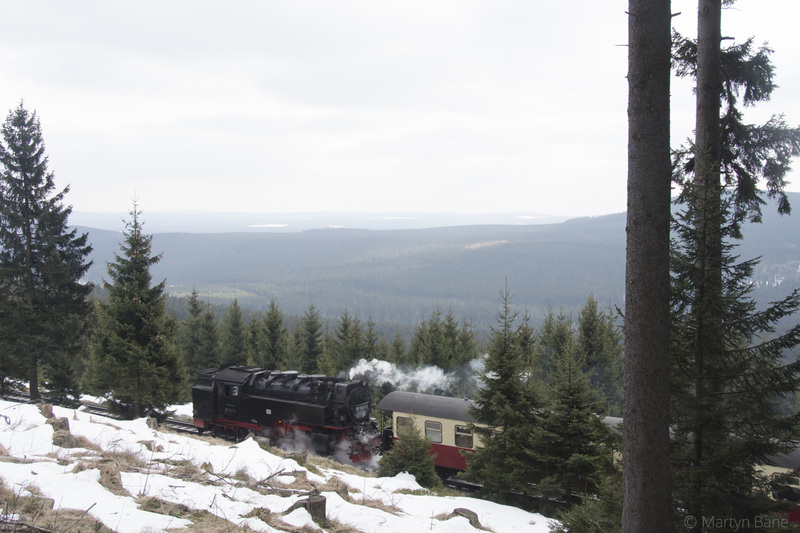 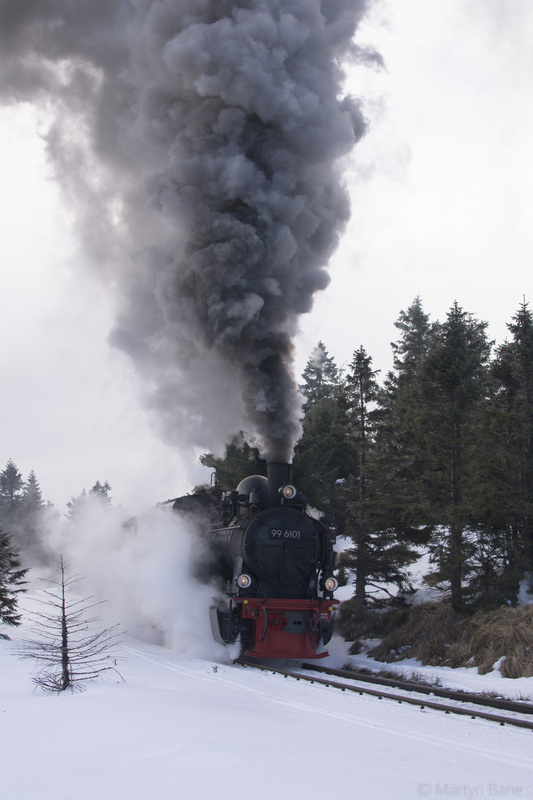 57 99 7247 drops downhill towards Shierke with the 13:59 Brocken to Wernigerode. 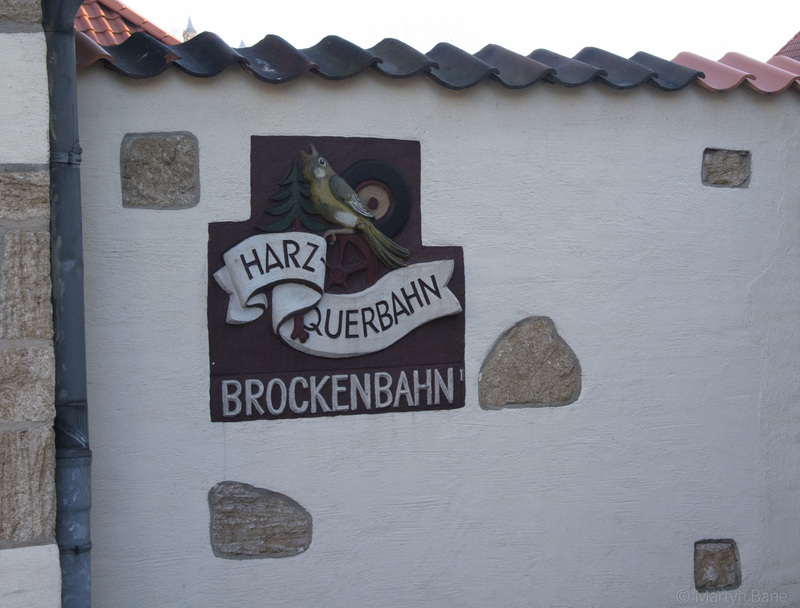 58 A largely, but not entirely forzen, stream in the forest. 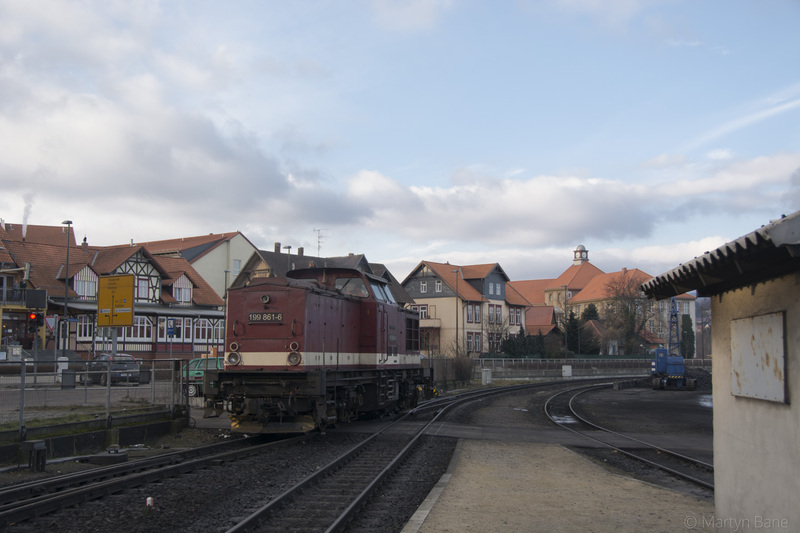 59 Back at Drei Annen Hohne, 99 7232 sets back towards its train, the 14:51 Brocken to Nordhausen, which departed from Drei Annen at 15:40. 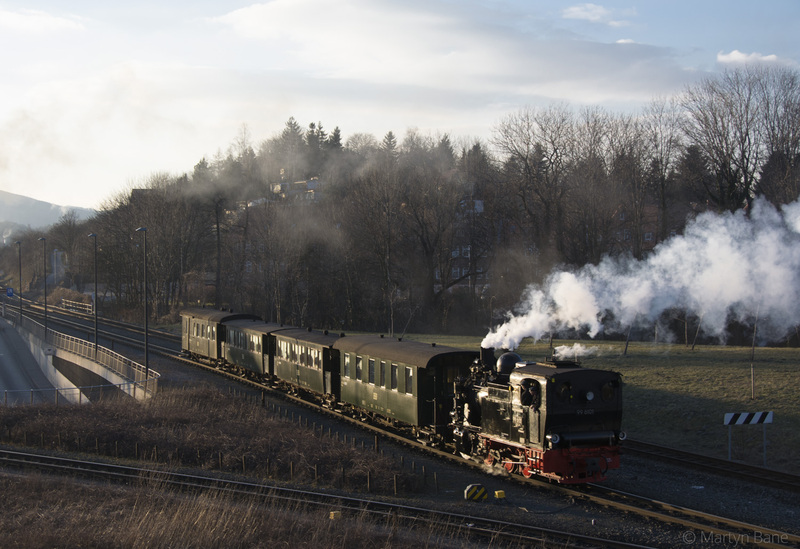 60 99 236 at the head of the 14:55 Wernigerode to Brocken takes water as 99 7232 sets off for Nordhausen. 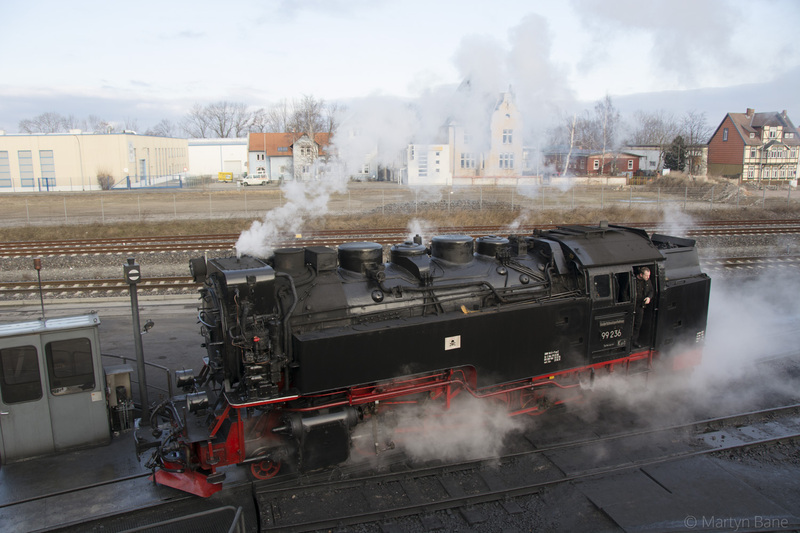 61 99 236 head on at Drei Annen Hohne. 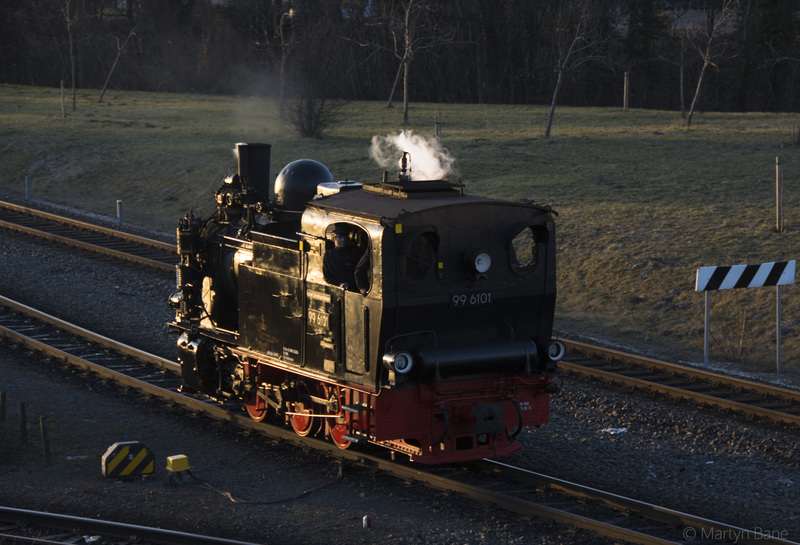 62 Glinting in the afternoon light. 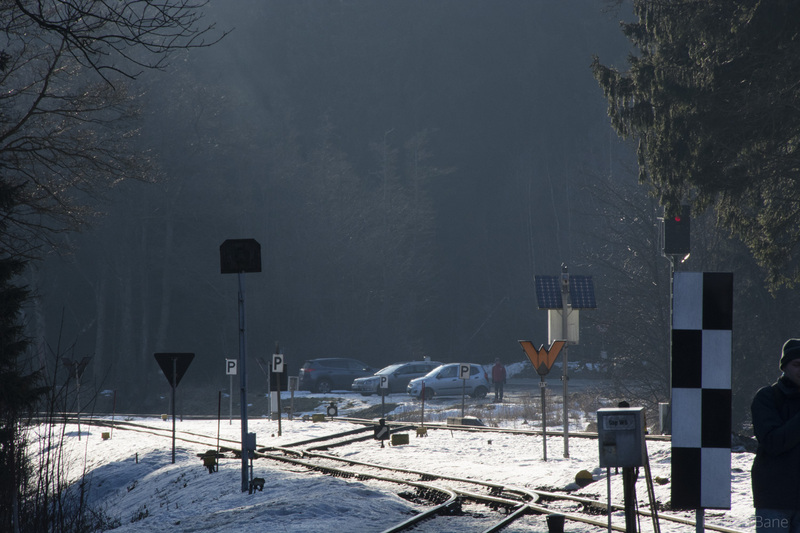 63 Looking south at Drei Annen Hohne. 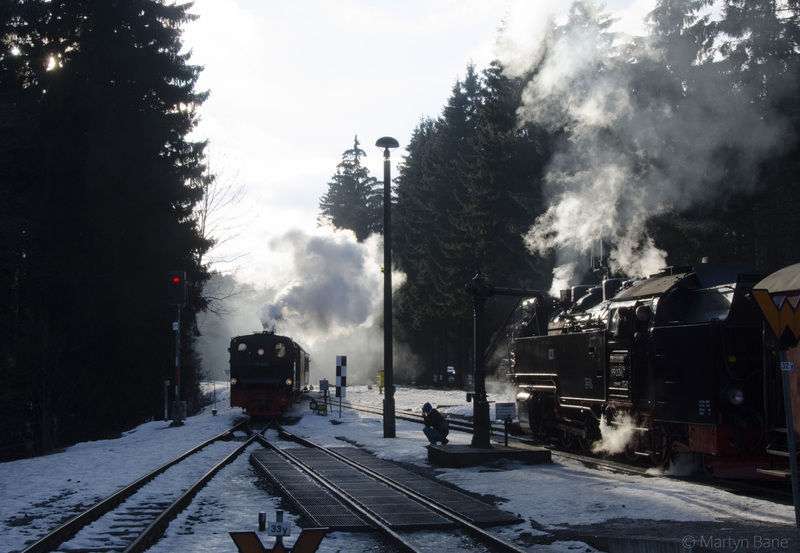 64 Backlit 99 6101 arrives from the Brocken with its Tradszug, 99 236 will head up the hill once it has fnished taking water. 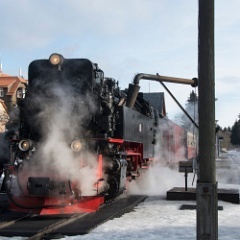 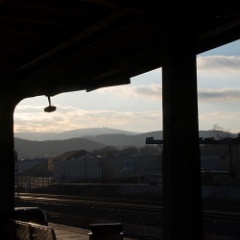 65 The Brocken from Wernigerode DB station. 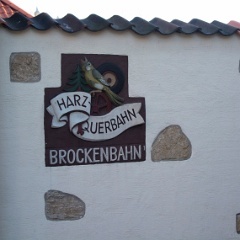 66 There are two of these old signs at Wernigerode. 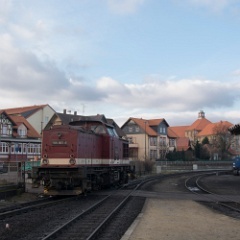 67 99 222 on the disposal road at Wernigerode. 68 Having got my timing wrong I was in the wrong spot for the arrival of the Tradszug. 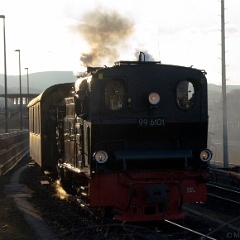 But it worked out OK.
69 99 6101 propels its Tradszug set out to the carriage depot at Wernigerode. 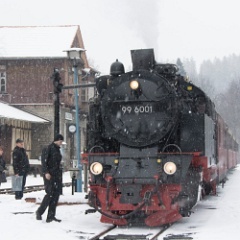 70 Meanwhile 99 5906, which has worked a Tradszug to Elend is also back in Wernigerode. 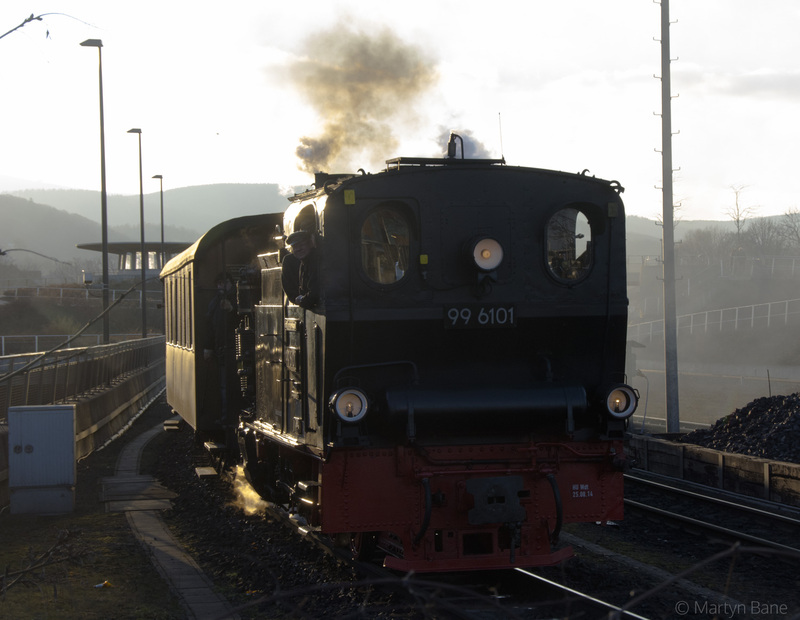 71 Having deposited its stock 99 6101 runs light back to Wernigerode depot. 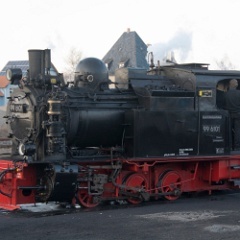 72 99 6101 on the disposal road with 99 222 behind. 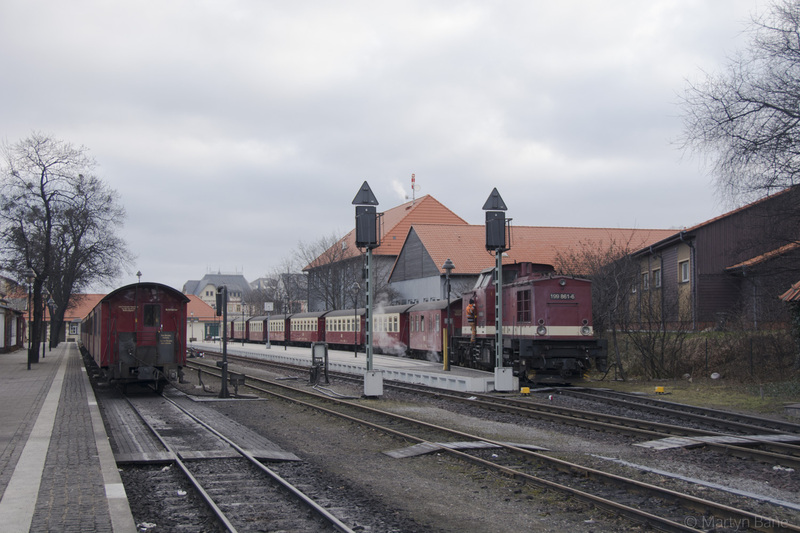 73 99 5906 shunts its short train out to the carriage shed at Wernigerode. 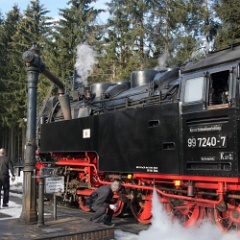 74 99 6101 is an ex army loco which has been on the Harz system for many years. 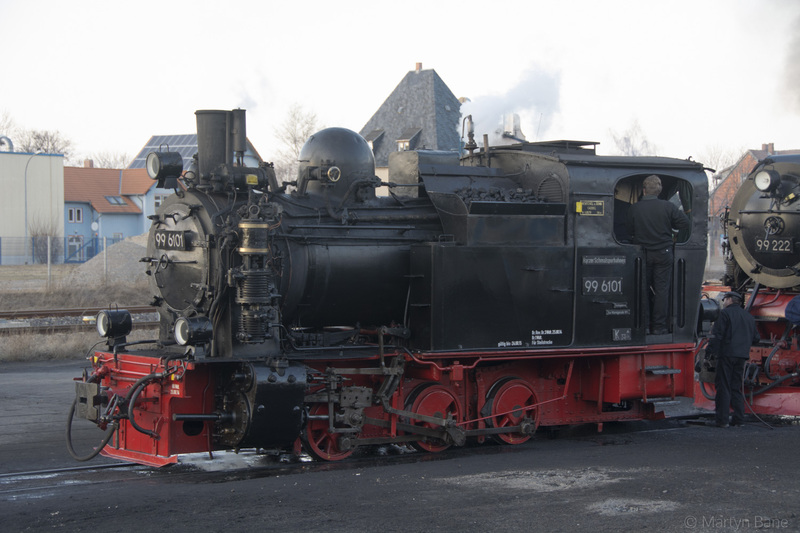 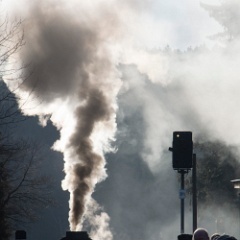 Sister loco 99 6102 is a saturated loco whereas 6101 is superheated.